In 2016 Franklin County Emergency Management (FCEM) engaged weather intelligence provider WeatherSTEM to create a system to monitor driving conditions. The bridge experiences high-speed winds that can swirl in from any direction at any time, causing dangerous driving conditions and expensive, time-consuming bridge closures when high-profile vehicles tip over. 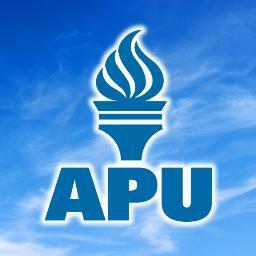 American Public University System (APUS) today announced the donation of three additional WeatherSTEM systems as part of its continuing mission to serve its local community and enhance learning opportunities for K-12 students in its home panhandle region and adjacent public school districts in West Virginia. 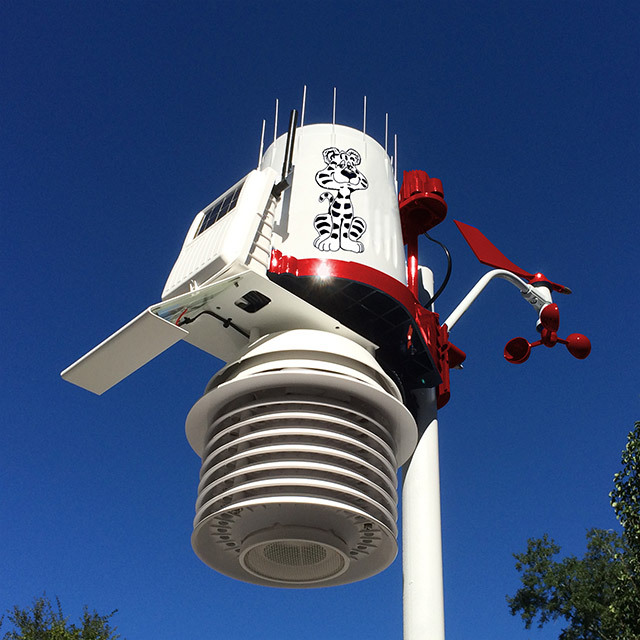 Tracking the weather will be a breeze thanks to the high school’s new weather station. 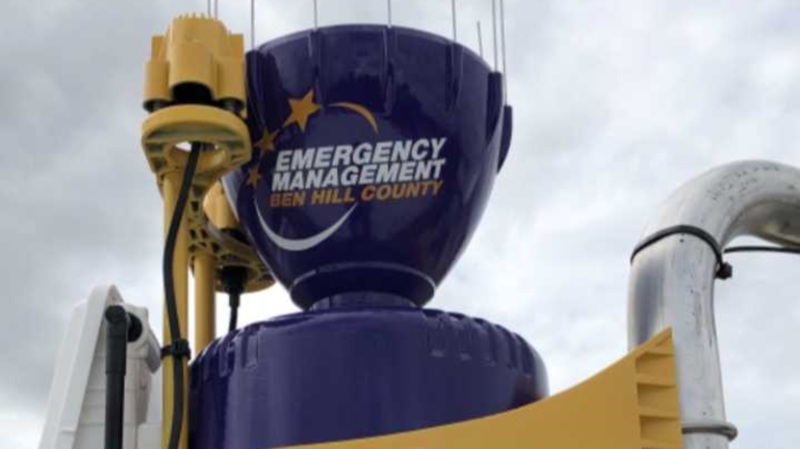 The Ben Hill County Sheriff's Office installed a new weather stem unit on top of their facility, which helps them warn the public of dangerous weather. Installation of the unit cost about $5,600 and it has two live camera feeds on it. Public safety officials say it was worth the cost. Escambia County schools now have a new tool to keep outside activities from becoming dangerous. 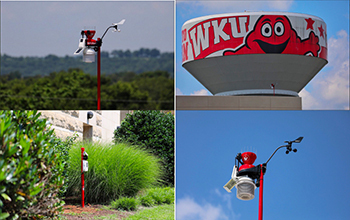 WeatherSTEM stations are being installed at all county high schools. They'll monitor for extreme temperatures and humidity levels, and alert school employees of any dangerous conditions. 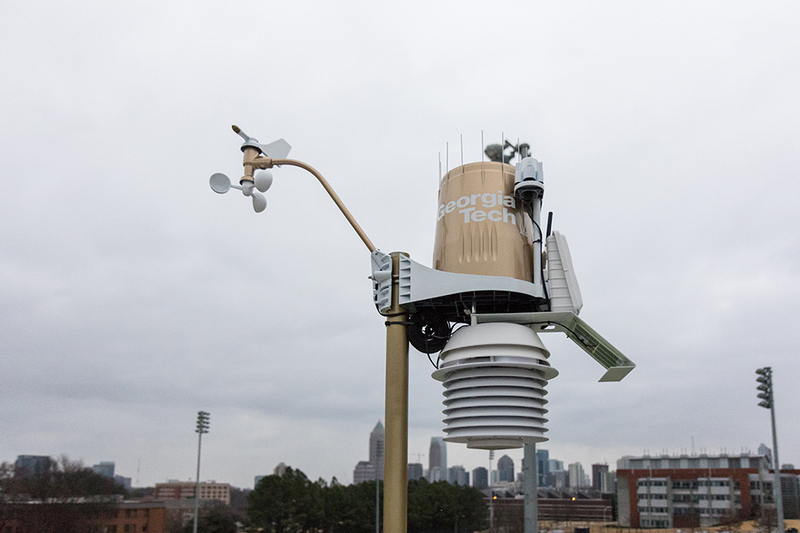 UTD recently installed a new weather station, called WeatherSTEM, on the roof of Residence Hall West to monitor weather conditions near campus. 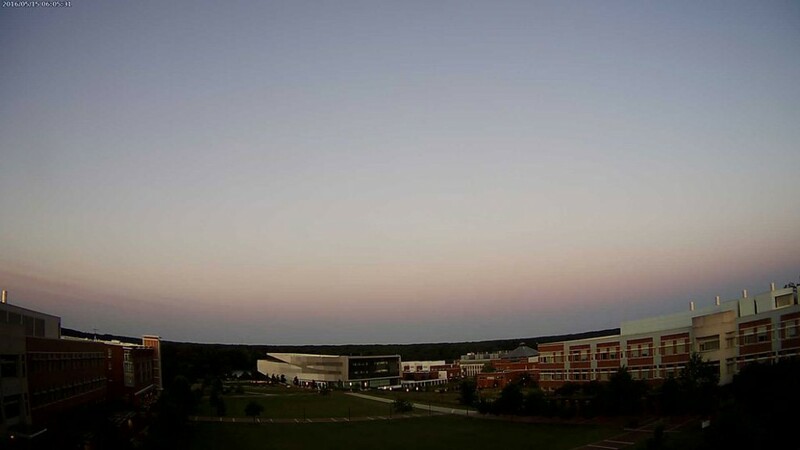 A website, dubbed "Comet Watch", provides students with up-to-date weather information as well as real-time camera feeds. Twitter and Facebook feeds disperse selected information from "Comet Watch" on social media. 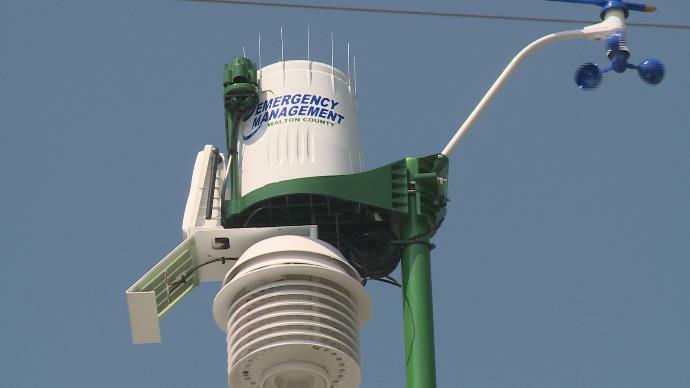 Emergency management specialist Angela Dees said the previous weather station was lacking, so the department had been looking for an upgrade. 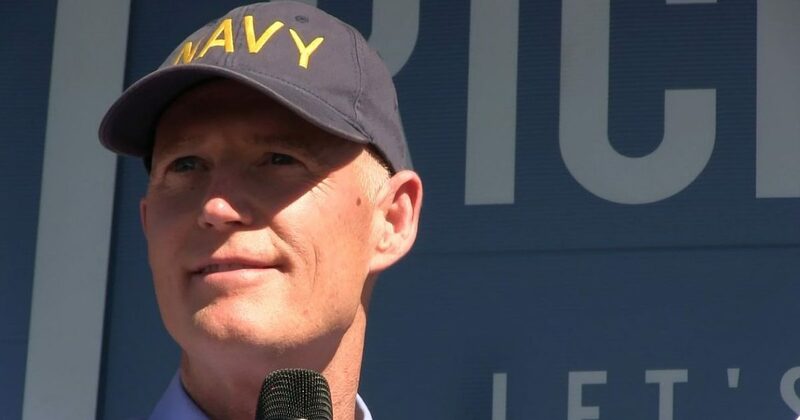 Unworkable, a report from Public Citizen and the Farmworker Association of Florida released Tuesday, spells out the risks to the state's large population of outdoor workers, particularly construction and agricultural workers. 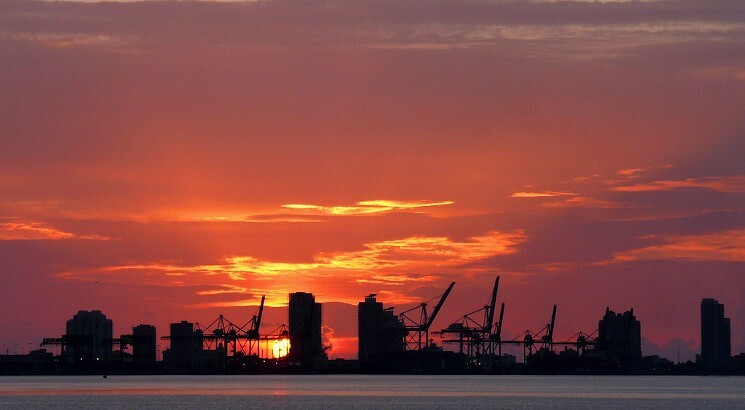 The Sunshine State has one of the highest rates of heat-related hospitalizations in the nation, according to the report. That number is likely an undercount, since strokes, heart attacks, asthma and even mental illnesses can be aggravated by high heat. The report used Wet Bulb Globe Temperature (WBGT) data from WeatherSTEM's more than 200 Florida WeatherSTEM units. 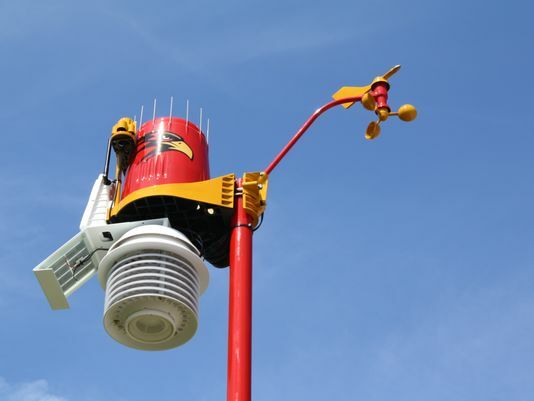 Warm Springs Middle School has a new cutting-edge WeatherStem meteorology system and weather station with real-time data that was up and running as of September 19. 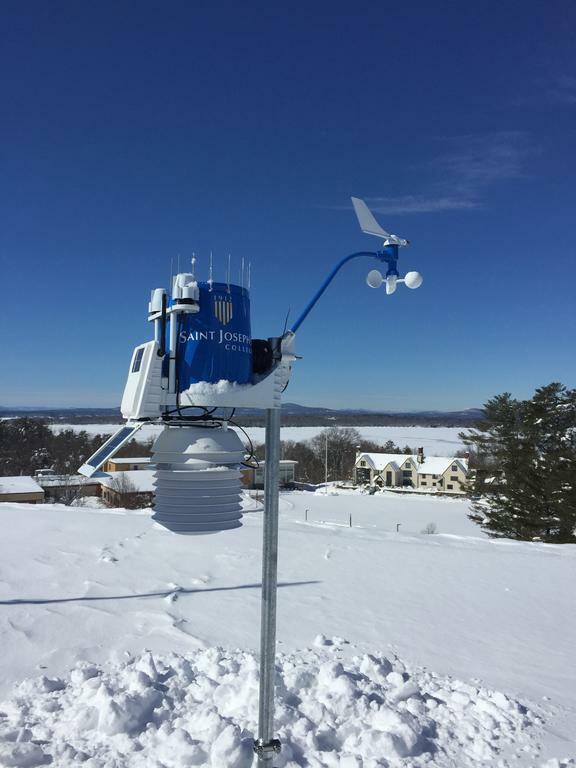 Middle school eighth grade science teacher Charles Wilson said he applied for the WeatherSTEM weather station program through American Public University System (APUS) in Charles Town. 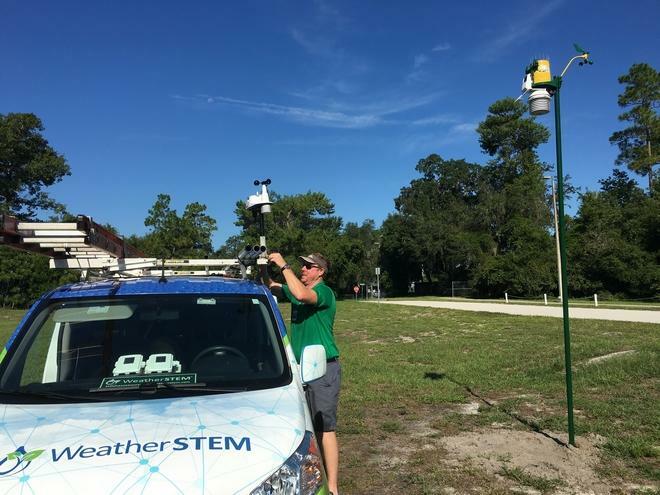 WeatherSTEM Director of Infrastructure Luke Hunnewell from Tallahassee, Florida installed the weather station at the middle school in late July. 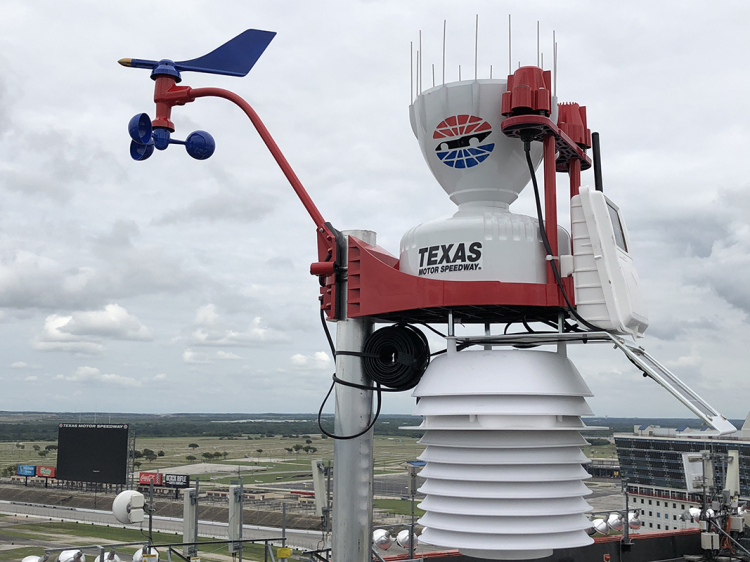 Texas Motor Speedway has become the first motorsports venue in the country to install a WeatherSTEM weather station that will benefit its fans and the motorsports industry with comprehensive real-time weather data specific to that exact location. 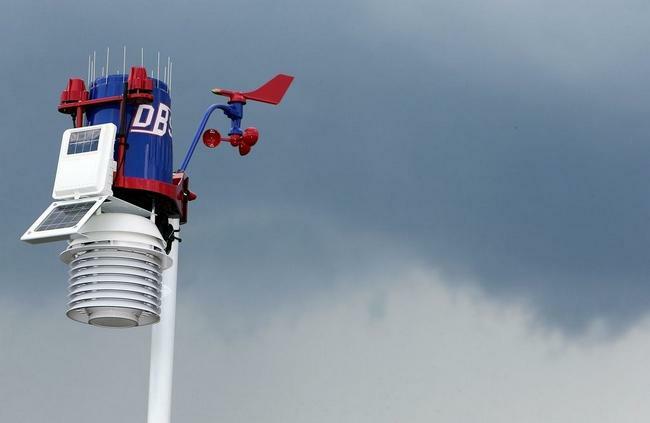 WeatherSTEM has installed its weather units at more than 30 college facilities as well as Heinz Field, home of the NFL’s Pittsburgh Steelers, but the world-renowned venue in Fort Worth will be the first of its kind in the motorsports arena. 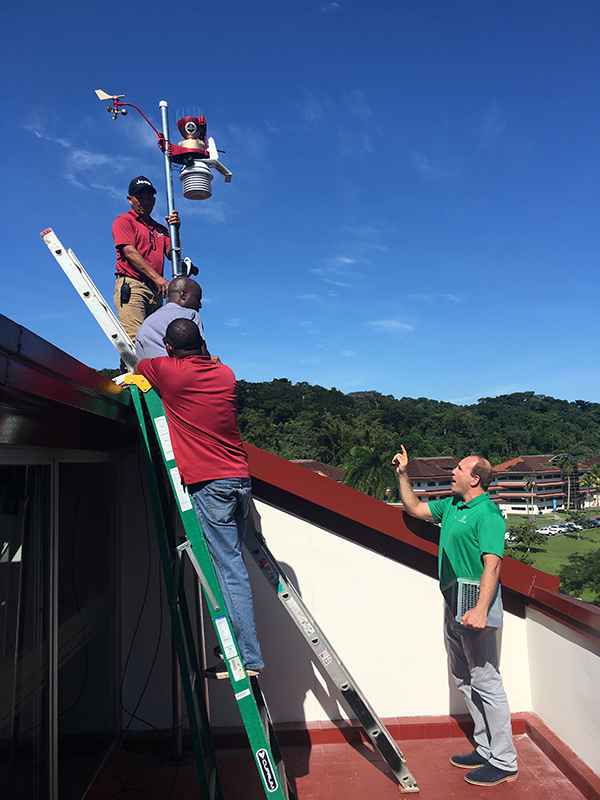 Florida State University-Panama is now home to the first international installation of WeatherSTEM, a weather tracker that sends out hyperlocal alerts and tracks data at a specific location. The WeatherSTEM station was installed earlier this month at the Panama campus with the help of WeatherSTEM CEO Ed Mansouri and FSU Vice President for Research Gary K. Ostrander. FSU-Panama is an international branch campus of the university in the Republic of Panama that serves more than 400 students. 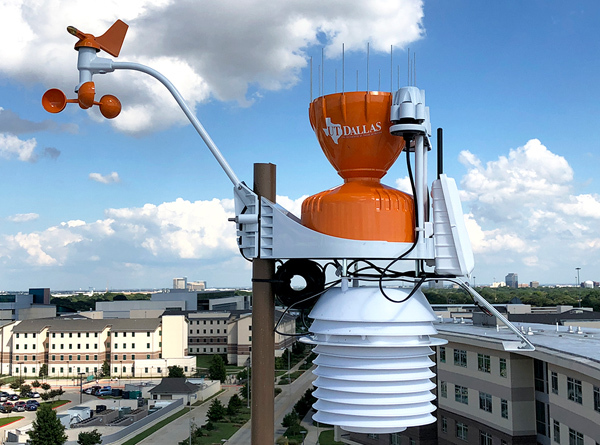 A new weather station at The University of Texas at Dallas will help track inclement weather and its possible impact on the campus community. And self-described "preparedness-junkie" Angela Dees is in her element. As many of you know, Brian Ballard topped off his empire with an impressive new "castle" in downtown Tallahassee. There are plenty of beautiful new features to the building, but with Hurricane Michael bearing down on the Southeast and several other storms brewing in the Atlantic, I find myself thinking about one feature in particular on the Ballard Partners edifice. 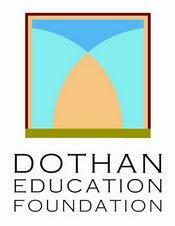 The Dothan Technology Center has taken steps to be above and beyond when it comes to weather information. The technology includes a cloud camera that produces daily time-lapse videos of the sky conditions that day and technology that measures weather conditions that is then displayed on their public website. Alachua County has installed a new meteorological observation system at the High Springs Fire Station. 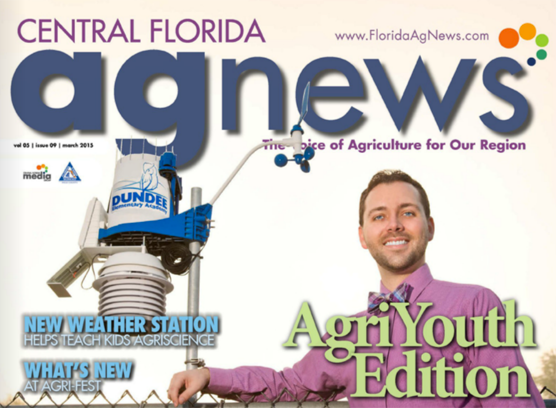 Alachua County Commissioner Ken Cornell won the free WeatherSTEM system in a drawing at the Florida Association of Counties conference in November 2017. 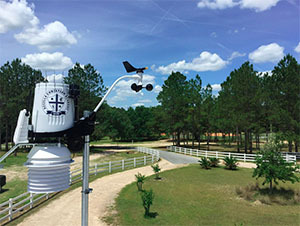 WeatherSTEM provides users with an integrated meteorological observation system that allows Alachua County residents to receive real-time information on local weather and its impacts. WeatherGeeks is a weekly podcast produced by The Weather Channel. This week's guest is WeatherSTEM CEO and Founder Ed Mansouri who tells the story of WeatherSTEM and how he came up with the idea for the program. Keeping an eye on weather conditions around critical infrastructure is a persistent problem for public agencies and private owners, particularly in underserved communities far from government weather stations. That was the issue faced by Pam Brownell, director of emergency management for Franklin County, Fla., a low-income coastal county in the state’s panhandle. In South Florida, a regional weather forecast often just doesn't cut it. "On any particular summer afternoon, I could be caught in a thunderstorm, whereas maybe a mile away, it could be dry as a bone," said Ed Mansouri, the founder and CEO of a new weather service. 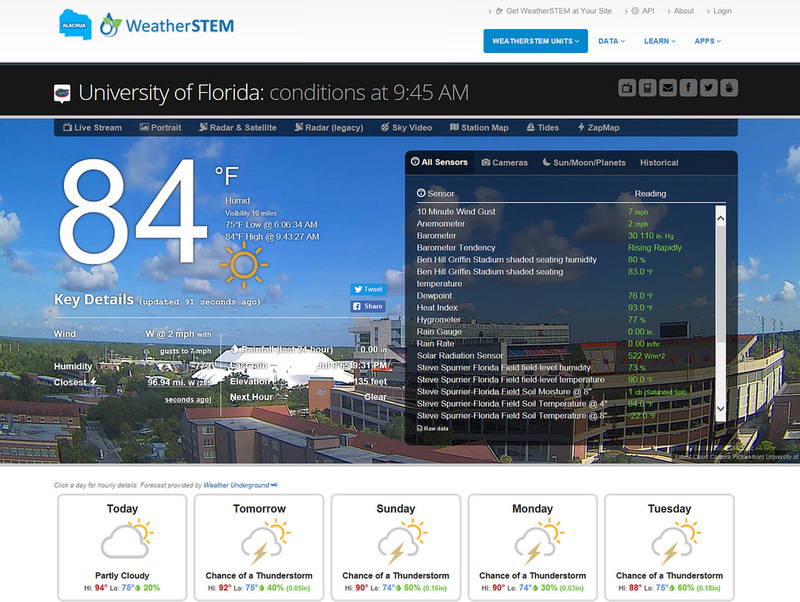 OrangeSTEM is a platform for monitoring hyper-local weather conditions throughout Florida. Emergency managers, researchers and forecasters are using it to analyze, plan, and respond. If this hurricane season is anything like last years – or worse – residents and emergency management need every form of help they can get. That includes precise measurements of temperature, humidity, wind speed and direction, air pressure, rainfall, and solar radiation. 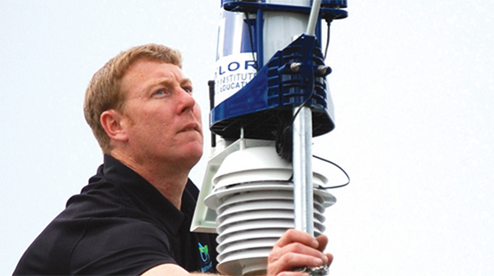 One innovative asset some emergency managers are using is called WeatherSTEM. WeatherSTEM is basically an all-in-one weather tracker that sends out hyper-local alerts and records data at a specific point in Florida. 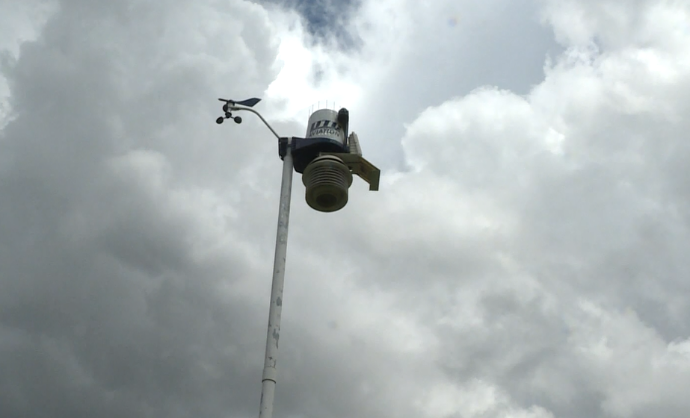 A network of these weather stations across the state, OrangeSTEM, forms a first line of defense against the storm. 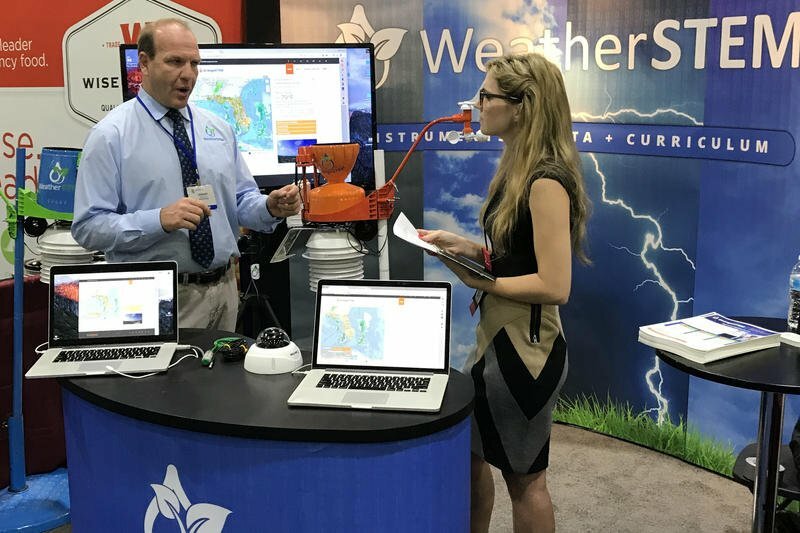 WeatherSTEM, an innovative platform used to track intense weather conditions, introduced its latest service, OrangeSTEM, at the Annual Governor’s Hurricane Conference in West Palm Beach. The new resource will provide forecasters and emergency managers in Florida with an effective new tool to prepare for and respond to hurricanes and other weather-related emergencies. In the past year, East Carolina University has dealt with all kinds of unpredictable weather, ranging from rain and snow to a hurricane that caused record-breaking flooding. 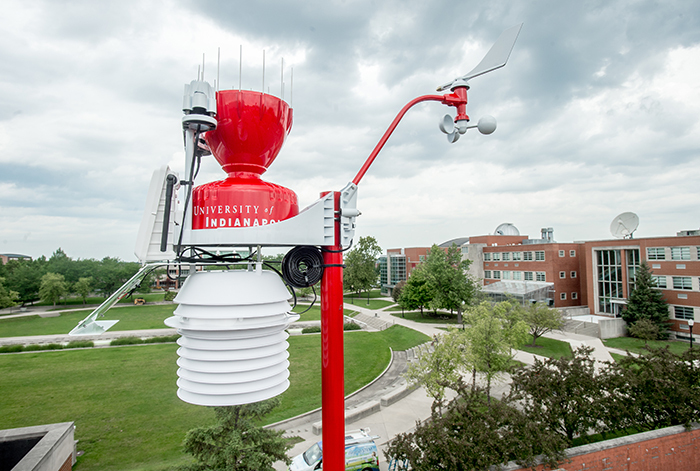 In 2017, the university decided to take a few more preemptive measures in an effort to further improve weather forecasts, including bringing WeatherSTEM to campus. 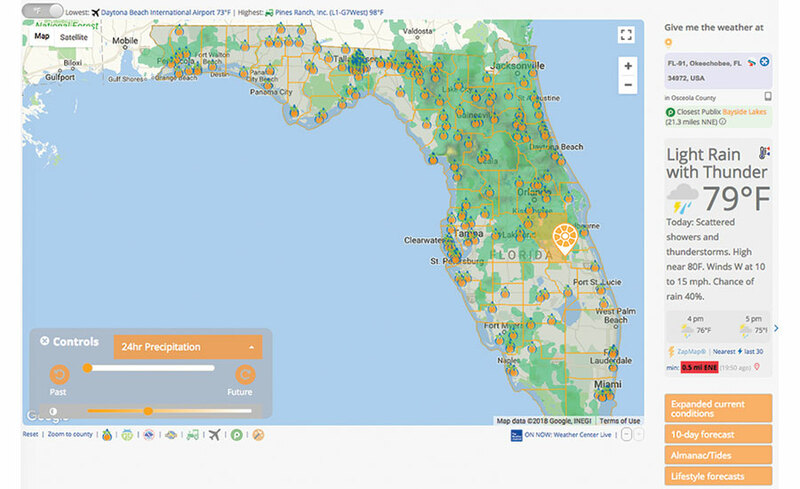 Earlier this month WeatherSTEM launched OrangeSTEM, a new service to provide a statewide system for monitoring weather conditions specific to Florida. OrangeSTEM provides reliable, local information on weather conditions in real time for communities and emergency managers – and by instantly compiling data from units across the state to track storms, OrangeSTEM can notify residents and state officials via web, mobile, and social media platforms where a storm's greatest impact may occur and when conditions become safe. That can get first responders onto the streets of a devastated community even sooner, potentially saving lives. 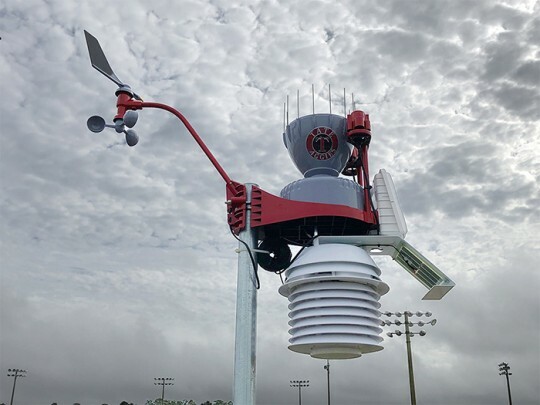 One Lee County School has a new tool to use when teaching students about the weather.Lee County Middle School East received a new WeatherSTEM weather station and camera thanks to a grant from the Sumter Electric Membership Corporation.The school started a STEM program this year. 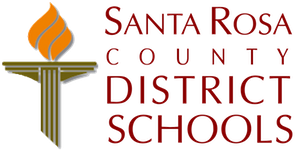 Santa Rosa County District Schools announced today that all regions of Santa Rosa County now have live, agricultural-atmospheric weather stations providing intelligence, safety, reporting, data analysis, lightning warnings, standards-aligned lessons, and sky cameras. 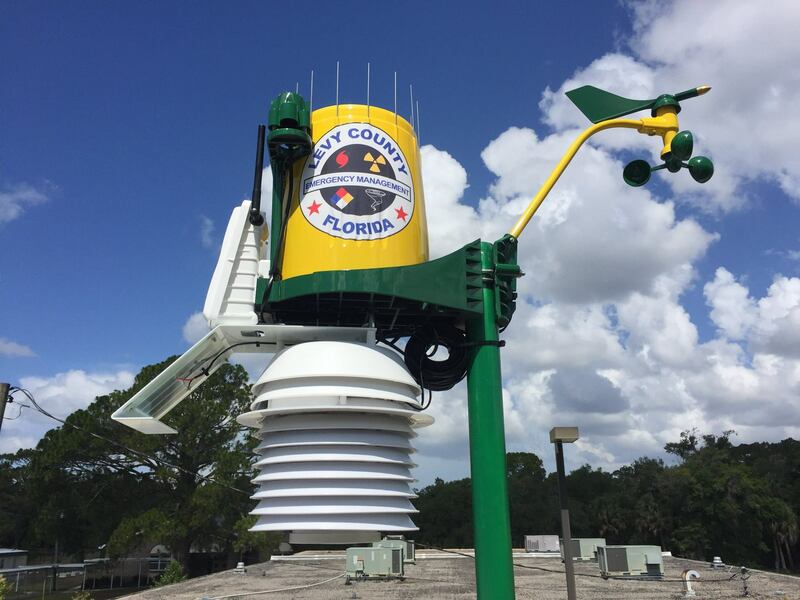 These stations were made possible through a unique public-private partnership with Santa Rosa County Emergency Management and WeatherSTEM. On February 7th, WeatherSTEM announced its OrangeSTEM initiative at the Florida Emergency Preparedness Association Conference in St Augustine. The company promised to deliver a platform and mobile app by March 1st. According to WeatherSTEM's website, it is "a platform (that) consumes live information to create and deliver interactive activities and assessments. The platform combines data from weather instruments, agricultural probes, Web cameras and other sensors to create immersive science education experiences and an introduction to "Big Data" and computer programming." There were legends to be explored, weather charts to view, meteorological instruments to make and a poll to be taken; all brought to the students at Sussex County Charter School for Technology by a new principal who has his own popular weather blog. And all to celebrate that grandest of holidays, Groundhog Day. Displayed against the familiar background of the double domes of McAnally Center overlooking Robert L. Harbison Stadium are the latest conditions in local weather.At ones fingertips is all the information (and probably more) needed to determine current conditions, recent weather and even upcoming forecasts.And much of the information originates from a small weather station that sits atop Greencastle Middle School. The long-range forecast calls for continued success for White Squirrel Weather at WKU. 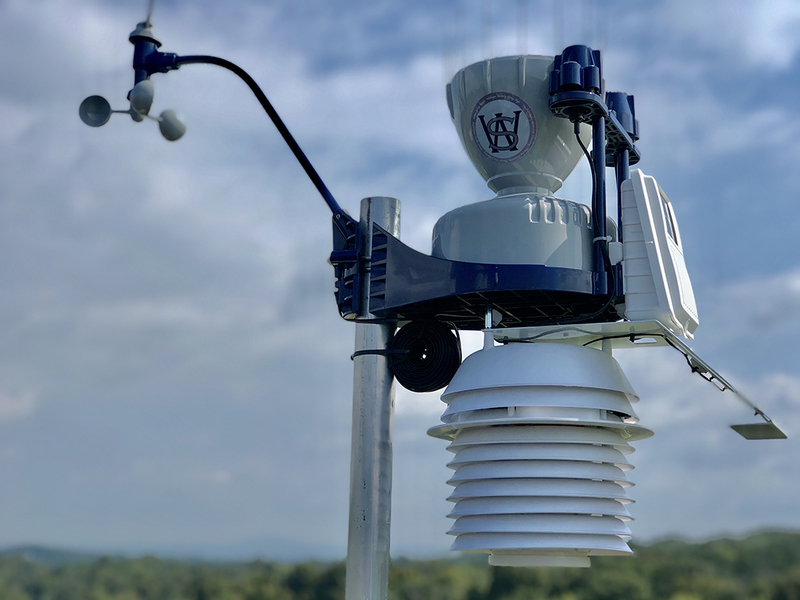 White Squirrel Weather is an applied research, professional service-learning initiative that leverages expertise within the WKU Meteorology Program to provide real-time hyperlocal weather observations and forecasts for the WKU campus community. Students at Ranson Elementary School now have a new way to learn about the weather, the atmosphere and other aspects of their environment.The school has implemented a cutting-edge meteorology system from WeatherSTEM, donated by American Public University System. Its 62 degrees, with wind speeds up to 17 miles per hour, when a band of nine students clamber up seven flights of stairs and emerge on the roof of Gittleson Hall, squinting against the sun.Their professor hands out instruments that measure humidity (called sling psychrometers) and walks over to the weather station that sits near the edge of the roof.The experiment begins. A few students take turns spinning the psychrometers like nunchucks. The rest scribble notes, struggling to keep their lab worksheets from blowing away. On the ground, 10 more students gather weather data at street level. Eventually, they will check their manual readings against those of the weather station. All five University of North Georgia campuses now have individual weather stations that provide data to faculty, students and the public. Each station has weather tracking equipment including anemometers to track wind speed and barometers to measure pressure. The stations reflect sunlight to determine the temperature and feature built-in cameras to record the local weather visually. As Irma whipped the waters off Miami into a frothy fury last weekend, a weather station mounted atop the University of Miamis Rosenstiel School of Marine and Atmospheric Science documented the rising winds.As a camera rolled, the stations wind meter clocked climbing speeds: first 26 mph, then 38 mph, 41 mph and 73 mph and into the 80s. Eventually winds peaked at 98 mph, enough to qualify as a Category 2 hurricane had they been sustained. Gusts ultimately hit 106 mph and up. The morning sky brightens from black to gray to green to blue to white. Eventually, the schools dock disappears under waves. Clouds wrap the sky. The ocean seethes. 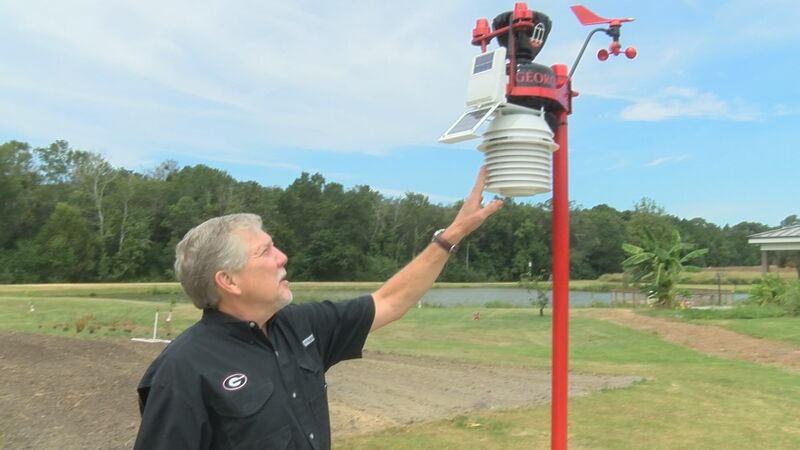 The University of Georgia in Tifton has a new, free weather tool on campus. 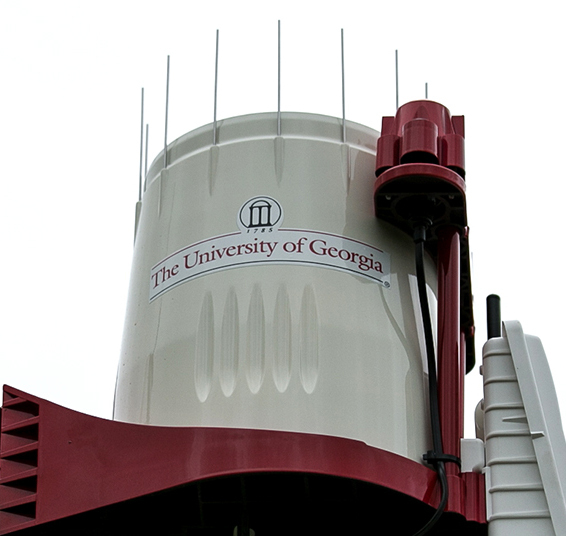 "Well this is a wind direction indicator, so that shows the direction from which the wind is coming, an anomometer," explained UGA Tifton Assistant Dean Joe West. 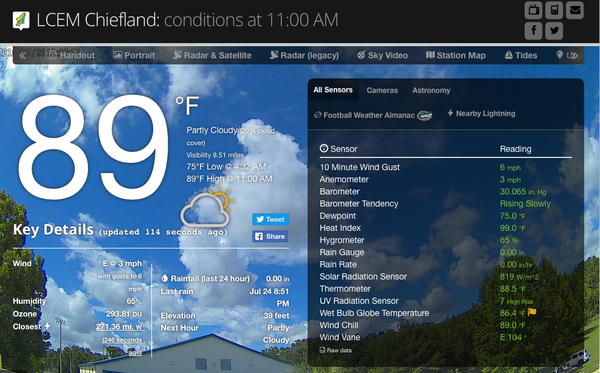 "WeatherSTEM is actually very advanced meteorological software." 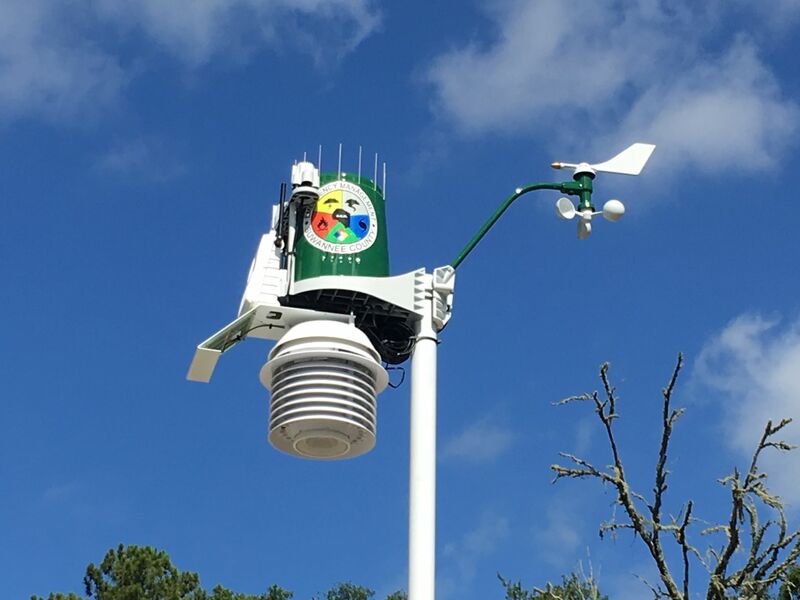 A new weather station is giving DeFuniak Springs residents and officials access to real-time local weather data. 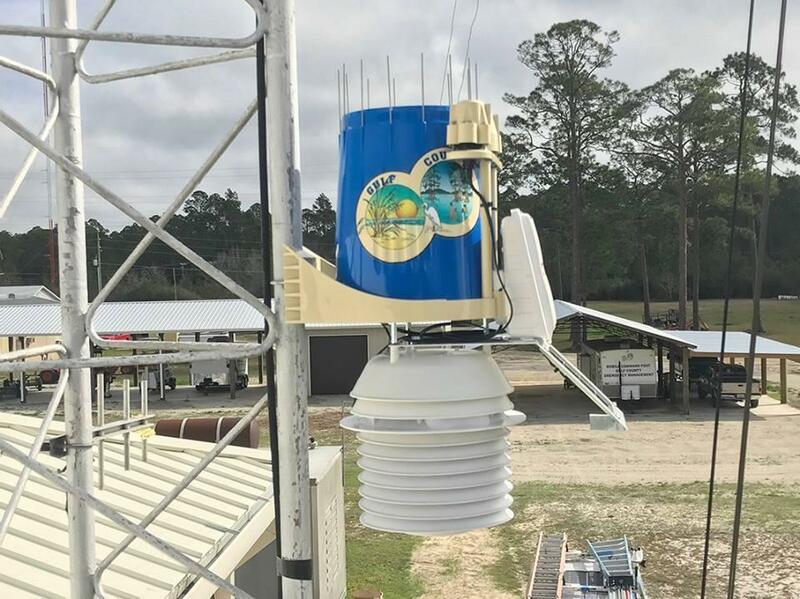 Walton County Emergency Management recently installed a WeatherSTEM station which includes multiple weather sensors and systems to gather information. The information can then be accessed by anyone online. Officials say the data can be crucial in emergency situations, and they hope to install additional stations. North Central Ohio Education Service Center has integrated a WeatherSTEM unit as a way to further science, technology, engineering and math education through lessons and activities.WeatherSTEM is a custom alert platform that uses weather sensors to gather and store data, displays the data online on a custom page, showcases current weather conditions and forecasts, and features data mining tools that can be used by teachers. Weather in eastern North Carolina is notoriously unpredictable bright blue skies one minute and rain the next. 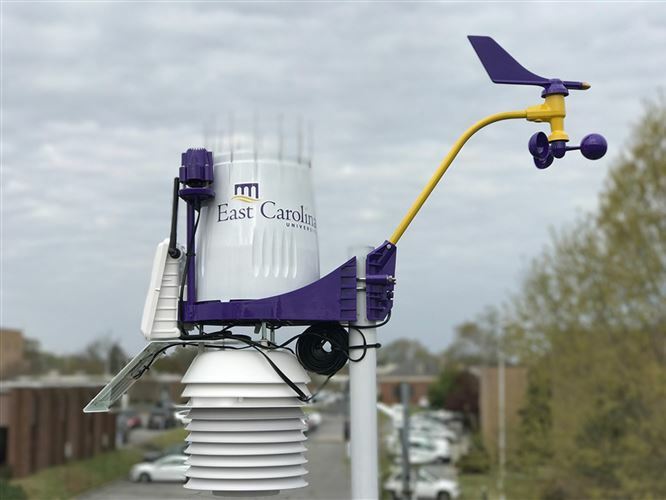 Now, East Carolina University has a new tool to help measure and forecast weather, so choosing between rain boots or flip flops will no longer be a guessing game. There's a new resource at UNCG, and Director of Emergency Management Zach Smith can explain how it benefits the entire campus and campus community. "I wanted to have a tool to put weather information at people's fingertips," he says. It's called WeatherSTEM ??? a sophisticated meteorology tool ??? and it's watching UNCG's weather 24 hours a day, through a unit that's perched atop the UNCG Police Station and a camera mounted on the Jackson Library tower. Ed Mansouri shook off his entrepreneurial jitters in 2014 and turned a hobby into a Tallahassee-based startup that now has a presence at the top of Vanderbilt University's football stadium. And not just there. 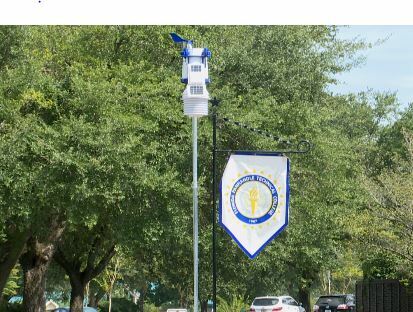 WeatherSTEM, a tech-based innovation that provides real-time weather conditions, is now installed at 290 locations, mostly K-12 schools in Florida. 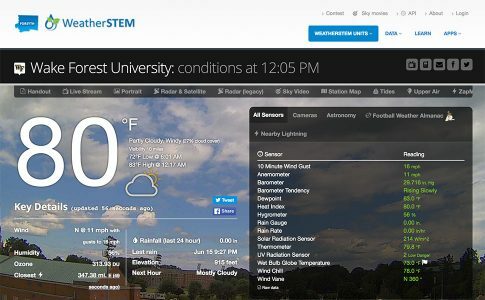 About 50 higher education campuses are using WeatherStem, including about two dozen major college football stadiums. 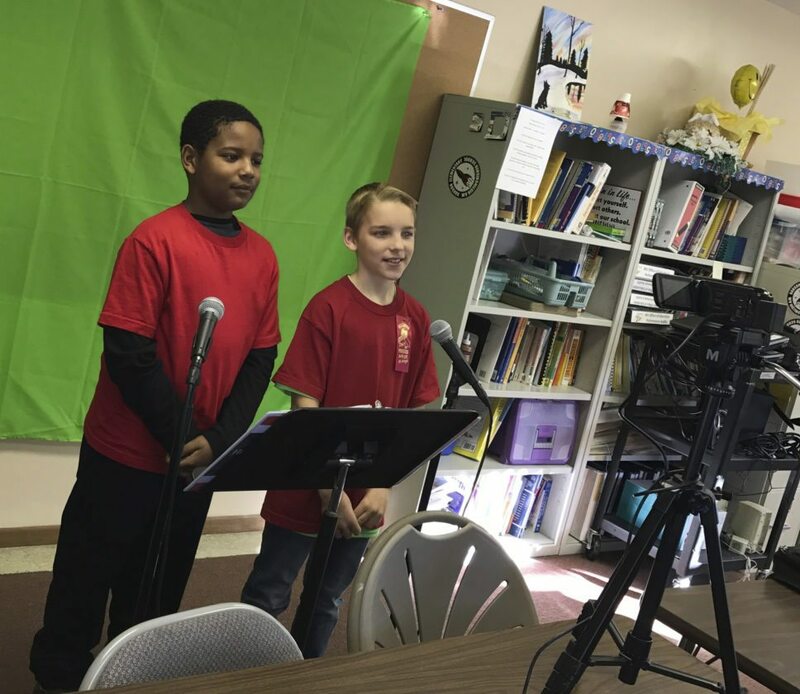 Students at Reach Cyber Charter School have a new tool to learn about the weather. It's called Weatherstem. 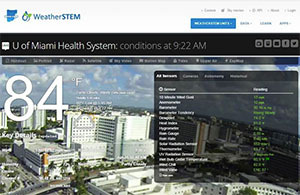 It not only provides current weather information, it also archives data, and has live cameras. Students across the state can access this information at their computers. 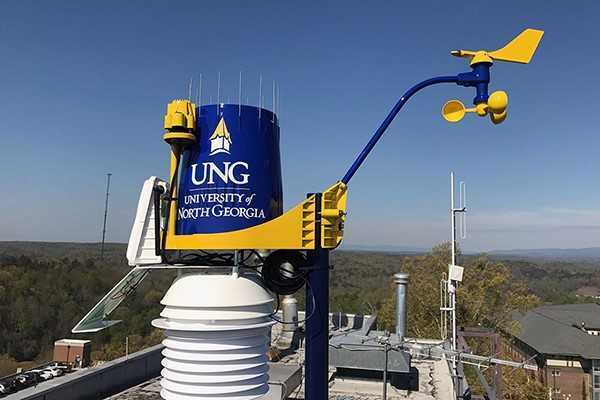 The University of North Georgia's (UNG) Lewis F. Rogers Institute for Environmental & Spatial Analysis (IESA) purchased five weather station systems for classroom instruction and data mining use. Dr. Jamie Mitchem, professor of geography at UNG, believes the study of weather provides an excellent foundation for science, technology, engineering and math (STEM) education as well as plenty of opportunities for exposing students to topics from a variety of disciplines. 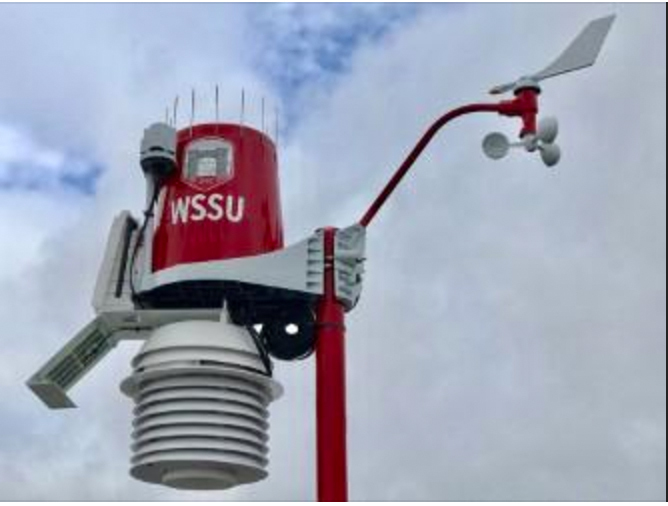 Students and faculty at Winston-Salem State University will get early warnings for severe weather thanks to a high-tech weather monitoring unit recently installed on campus. 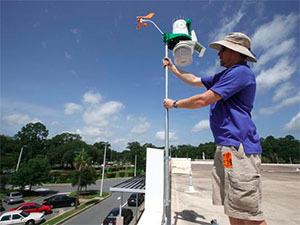 But the ability to warn of severe weather is only one of the capabilities of the station, which was installed on the roof of the three-story Thompson Student Services Center.The station, a product of WeatherSTEM, a company based in Tallahassee, Fla., links to the web, and provides text alerts for changing weather conditions, forecasts and a live camera feed. Gulf County Emergency Management can now provide real-time weather data for Gulf County Emergency Operations Center and surrounding neighborhoods, thanks to partner WeatherSTEM.The founder and CEO of WeatherSTEM, Edward Mansouri, created the WeatherSTEM platform as a way to infuse K-12 STEM (Science, Technology, Engineering, and Math) curriculum in schools with live data.The weather stations were donated and installed in various schools across the country, so students can have real world experience with the curriculum that they are being taught in the classroom. Those of us in Franklin County who are fixated on following the most up-to-date, comprehensive and complete weather report on local conditions were treated to a nice gift last month. 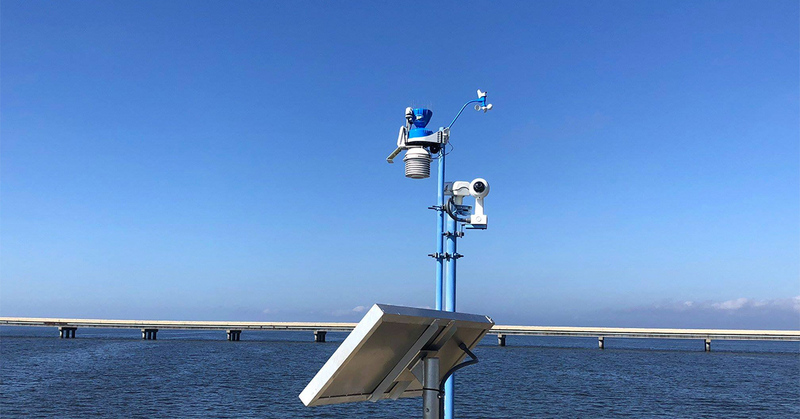 Tallahassee entrepreneur Edward Mansouri, chief executive officer of WeatherSTEM, and his staff donated and installed one of the company's weather stations at the tip of the old St.George Island bridge jutting out from Eastpoint. The unit has two high-resolution live cameras, pointed towards the island and bay, along with a wealth of solar-powered weather sensors and measuring gauges that can monitor everything from solar and UV radiation, rain rate and rainfall, temperature and humidity, wind speed and direction, and wet bulb globe temperature. Pine Grove Middle Schools new WeatherSTEM station improves local access to real-time weather data and severe weather updates,according to a press release.The station and system provide weather data similar to national weather systems, which can be accessed through the WeatherStem website, app, and social media, according to the release.Paid for with state grants, the station was installed last month, said Dr. Monica Dyess, Pine Grove STEM coordinator. 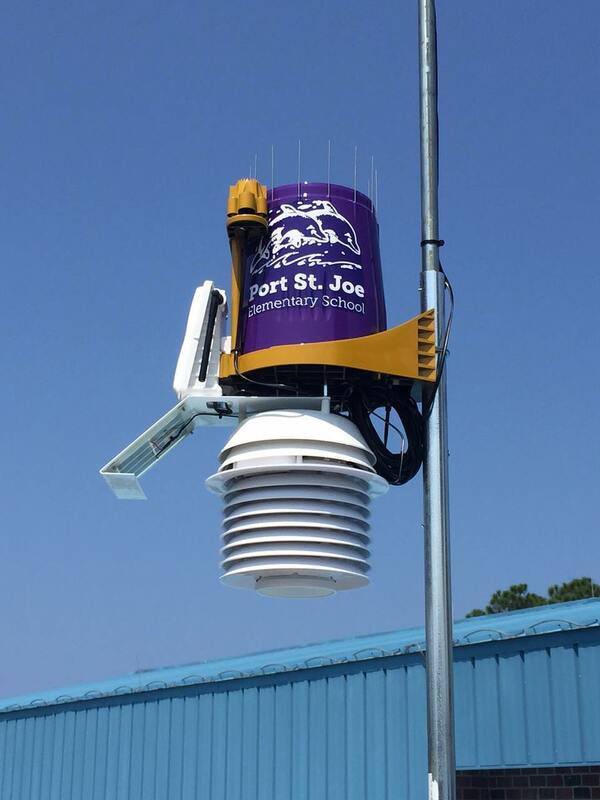 Weather station gives St. Joes high-tech eye in sky. A new, high-tech weather monitoring unit at Saint Josephs College is already making it rain data, that is.The college is the first institution in Maine to boast a WeatherSTEM unit, an advanced meteorological monitoring station that constantly gathers at least 15 elements from the local atmosphere including temperature, humidity and wind speed and pushes that information to an online database where it can be accessed almost immediately by researchers, students and the public. Winfield Elementary School looks like any other school but if you look up you'll see a weather station on its roof. Cameras and sensors collect weather data then it goes online. The weather station was installed in December and is now being used by the entire district. 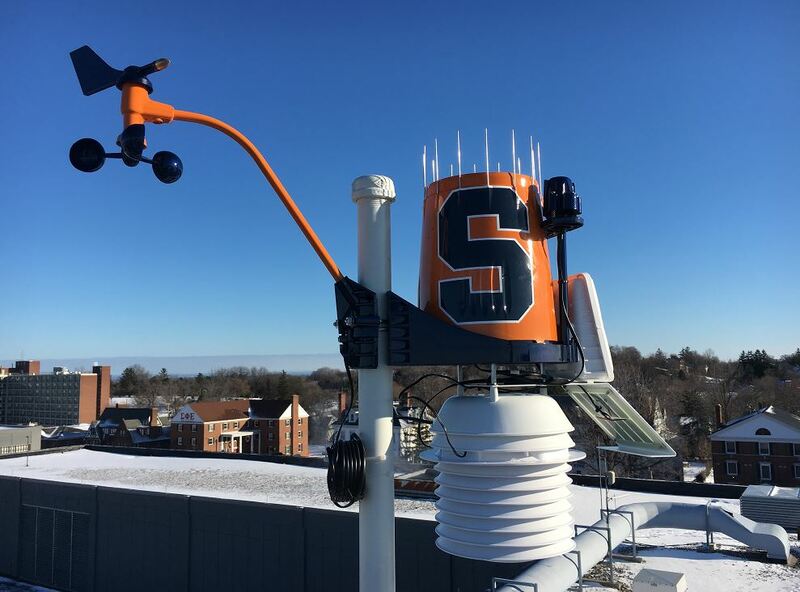 Real-time weather data and a live look at the Syracuse University main campus is now available, thanks to a donation from WeatherSTEM. 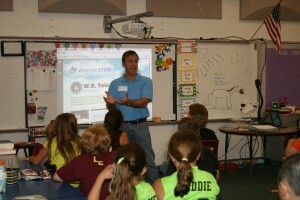 Ed Mansouri, Florida State University alumnus, is the creator of WeatherSTEM. 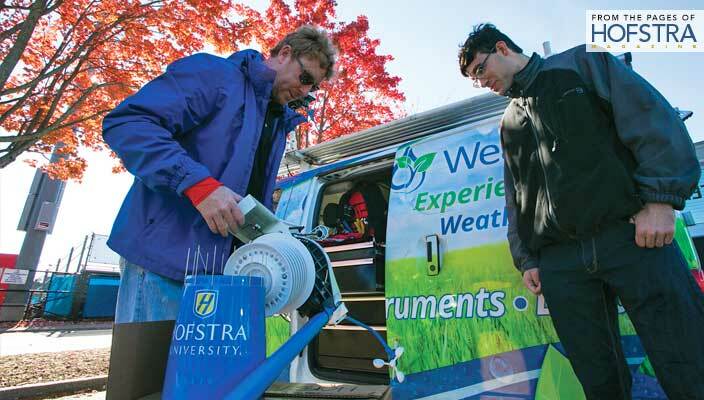 His initial goal for this program was to provide weather stations to K-12 schools with science technology and engineering curricula, but now, many Atlantic Coast Conference universities, including Syracuse University, have received the system as a donation. Typically, the system retails at $5,000, with annual fees around $1,750. The University is the 12th ACC institution to receive the station. 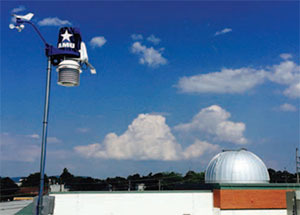 American Public University System (APUS) is continuing its mission to serve its local community and enhance learning opportunities for K-12 students in Jefferson County, West Virginia, and beyond, by donating two leading-edge meteorology systems from WeatherSTEM.WeatherSTEM is part of Ucompass, a Tallahassee-based software and services company supporting over three million students at more than 200 educational institutions, including APUS. It recently installed APUS-donated systems at Blue Ridge Elementary in Harpers Ferry and Jefferson High School in Shenandoah Junction. The Web-based platform combines data from weather instruments, agricultural probes, Web cameras and other sensors, aligning with APUSs own commitment to create immersive STEM education experiences featuring "Big Data" and programming. 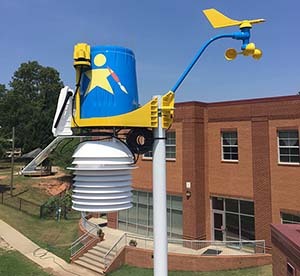 School days typically go on rain or shine, but now students at Daniel Jenkins Academy can track the rain and shine.On Tuesday, a WeatherSTEM unit that tracks data 24 hours a day for wind, wind speed, temperature, dew point, soil moisture and ultraviolet radiation, among many other things, was installed at the school. Brookwood Forest Elementary broke new ground this summer by turning its new outdoor learning space into a research laboratory, complete with its own weather station. 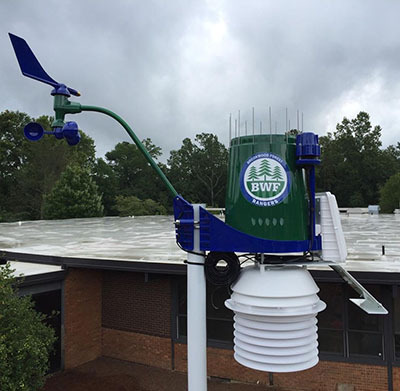 By becoming a flagship school with the WeatherSTEM program, Brookwood Forest joins the mission to connect classrooms and communities to the world around them. 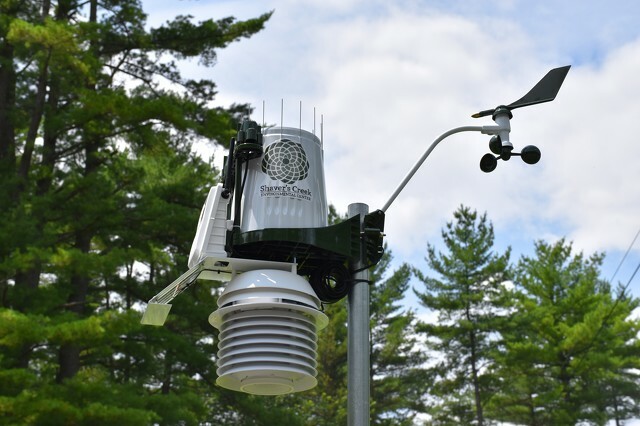 The weather station in Brookwood Forests Outdoor Learning Lab uses real-time weather data, agricultural data, a cloud camera and scores of other data-rich information to help learning come to life for teachers and students. 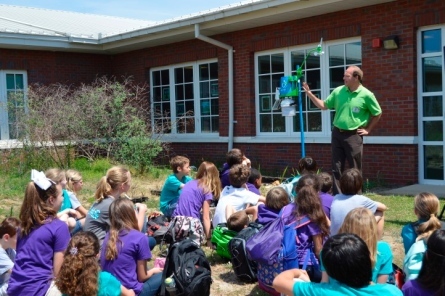 Students at Greenville, South Carolina's Stone Academy are studying weather with a new WeatherSTEM unit. The first school in the state to have the system, students are using it to learn how to apply weather to all facets of their daily life.Students study things like rainfall, lightning strikes, and cloud formations. The school hopes to one day inspire a future meteorologist. Would you rather watch this weekends Lions game, or one taped from decades ago? Edward Mansouri asked. Obviously you want to see the new game. 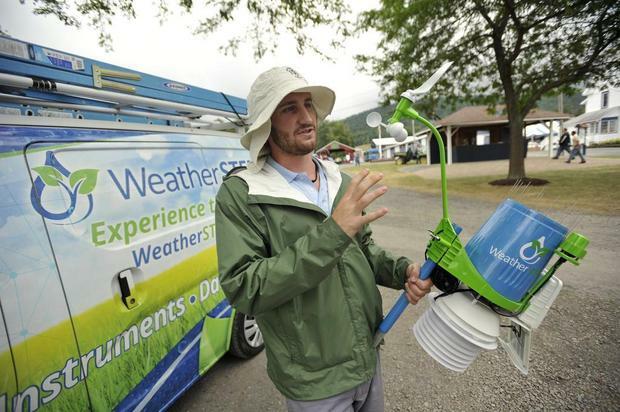 That was one way Mansouri, the chief executive officer for WeatherSTEM, described his product before having it installed at Shumate Middle School in Gibraltar. In his forecast for the future, Edward Mansouri predicts students will be drenched by torrential downpours of data. Were living in a world with more and more people and more and more computers keeping track of more and more data, the meteorologist said. The fluency and literacy of data is something that is going to be as fundamental in 10 years as knowing how to send a text message. So we have an opportunity to get a jumpstart on that today. 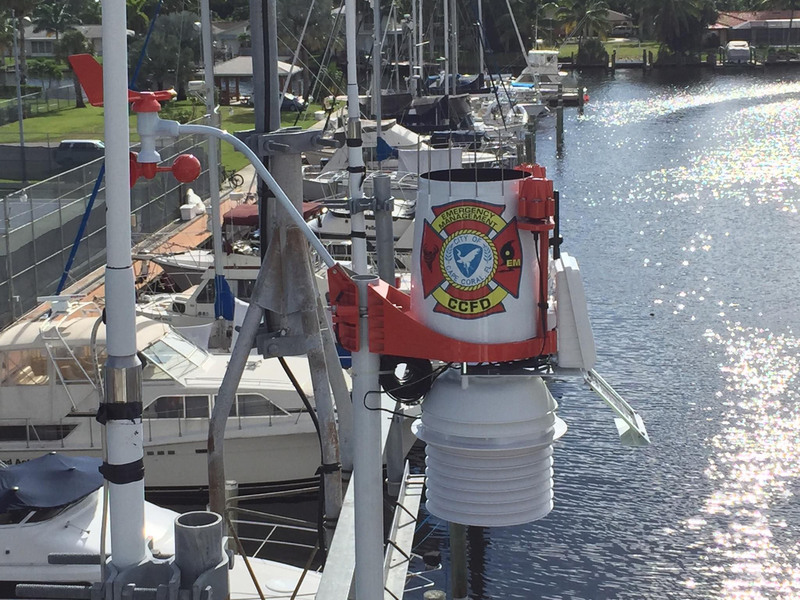 Cape Coral Emergency Management is now getting real-time weather information right from its own backyard. "We can get information as quickly if not quicker by having this unit here," said Jesse Spearo with Cape Coral Emergency Management. The department just launched its own weather station Tuesday, and they're already putting it to good use. A class of Lake Placid Elementary second-graders were fascinated Wednesday while watching a time-compressed video of the clouds above their school. Teacher Marcy Irwin told her students the video showed 24 hours of the cloud cover in one minute. Students at Heritage Middle School in Deltona now have a new way to learn about the weather, the atmosphere, and other aspects of their environment. 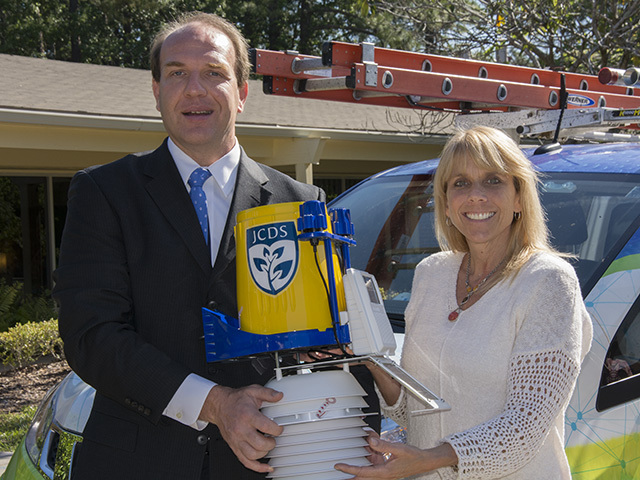 WeatherSTEM, a Tallahassee company, donated a weather-station unit to the school. It was installed Aug. 22. 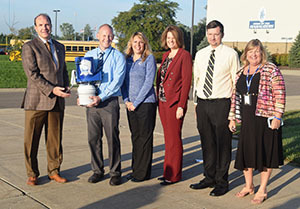 A WeatherSTEM system was installed at Hoover Middle School in Indialantic on Tuesday. 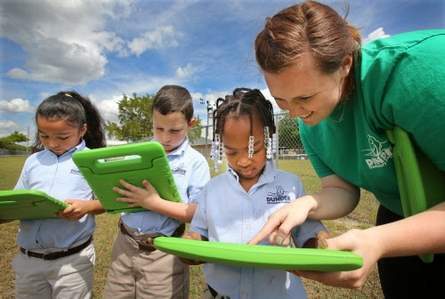 It is the first public school in Brevard County to receive the technology. You could be a kid in Japan and come online and start studying weather trends here at Hoover Middle School, said Ed Masouri, founder and CEO of WeatherSTEM. 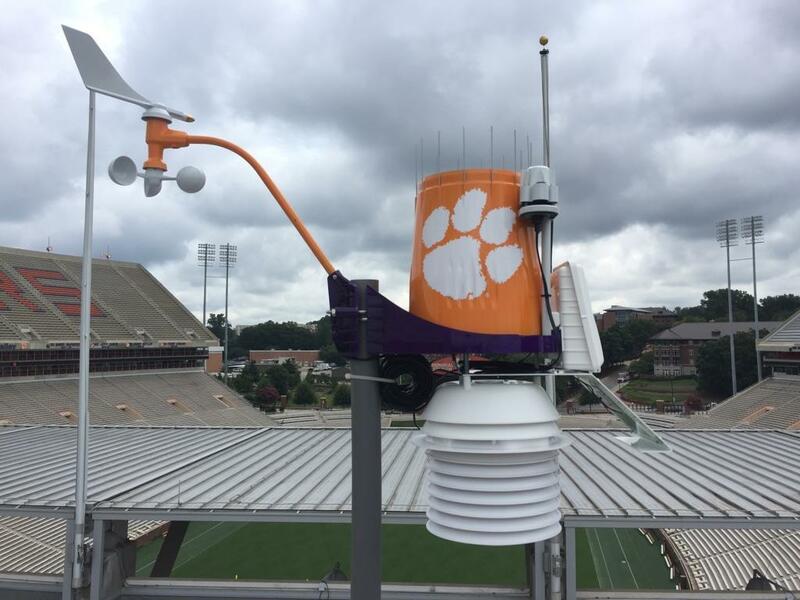 Real-time weather data and images from the top of Clemson Universitys Memorial Stadium now are available online from a new weather station. 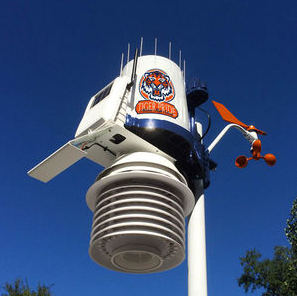 Florida-based WeatherSTEM donated the weather station to Clemson and 10 other Atlantic Coast Conference universities. The goal is to create an interesting intersection between education and health and safety, WeatherSTEM founder Ed Mansouri said. Marshall Shepherd, Georgia Athletic Association Distinguished Professor and director of UGA's Atmospheric Sciences Program in the Franklin College of Arts and Sciences, worked with Mansouri to have the station in place before the start of the fall semester so that he could use the data in his class on urban climate. A new weather system now in Levy County is making it easier for residents to get more specific local weather information, especially when it floods. 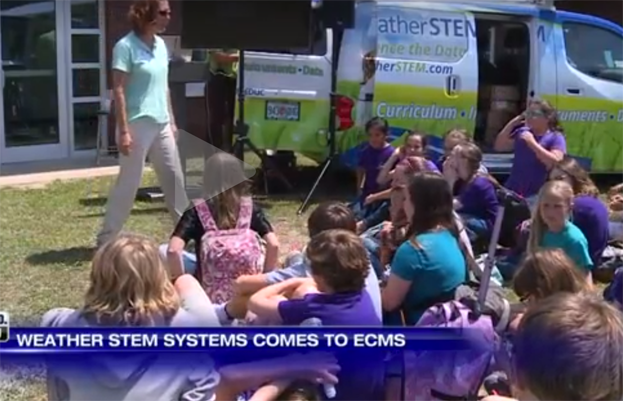 The system, called WeatherSTEM, can also help teach students. In the past, when checking weather conditions for an area, citizens of Levy County were limited to the information that was received by the National Weather Service through designated weather stations, which could be over 40 miles away or more in some cases. And, while this made for a perfectly acceptable way to monitor the general weather conditions, it made it difficult to determine things like rainfall rate, cloud cover, and humidity for a more local area. Now, citizens have the ability to get a more specific, localized picture of their weather. Florida is the number one state for lightning deaths, according to the National Weather Service. 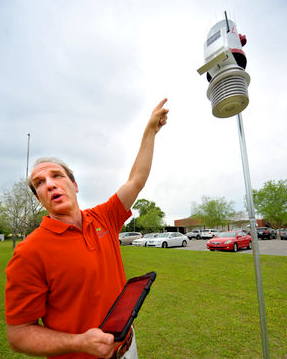 Just this year there have been four deaths in the state.To protect against sudden lightning strikes and other dangerous weather phenomena, Suwannee County Department of Emergency Management purchased a WeatherSTEM unit with $2,500 of left over grant money to put outside its office at 617 Ontario Ave SW, near Shands Live Oak. 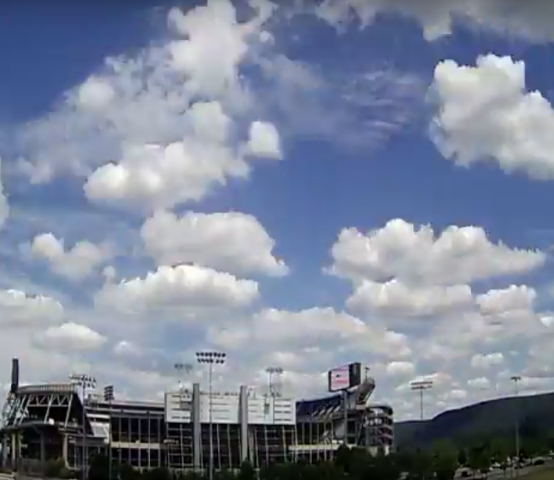 The time-lapse, one-minute YouTube videos from WeatherSTEM that encapsulate 24 hours of the skies over Beaver Stadium are like eating potato chips. You cant stop at eating or watching -- one. All are the work of Penn State alum Ed Mansouri, CEO of Ucompass, a tech company based in Tallahassee, Fla.
Ed Mansouri, a Tallahassee tech innovator who keeps looking for ways to bridge his passion for technology and weather, is starting to see his dream come to fruition. 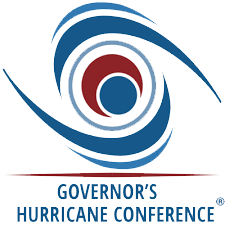 In May, Mansouri, 43, received the Florida Governors Innovation Award during the Hurricane Conference in Orlando. Mansouri calls it one of the most rewarding events in his life. Mansouri was recognized for his development of WeatherSTEM, a venture that has provided real-time weather stations in each school district in the state. His work has attracted the attention of agricultural interests, parks programs and universities. Now is the time of the year when many at Wake Forest are asking, How hot is it? Two new weather stations installed on campus will answer that question and many others about the weather around the clock. 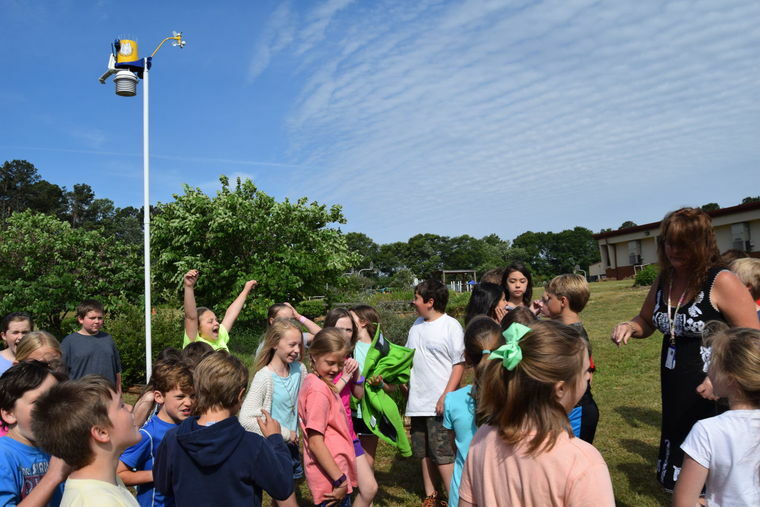 With WeatherSTEM, the students of Colham Ferry Elementary School can calculate an exact forecast that is reliable enough to be broadcast on The Weather Channel.The PTO earlier this year purchased a $3,000 state-of-the-art weather station that includes a convenient phone application and platform that gives a range of scientific data such as air temperature, soil temperature, soil moisture, UV radiation, solar radiation and more. WeatherSTEM's interactive K-12 STEM atmospheric sciences and agriculture curriculum will now be integrated into Instructure's award-winning learning management system, Canvas. Students using Canvas will be able to reference data from their local WeatherSTEM unit or any region's station from within an online course. 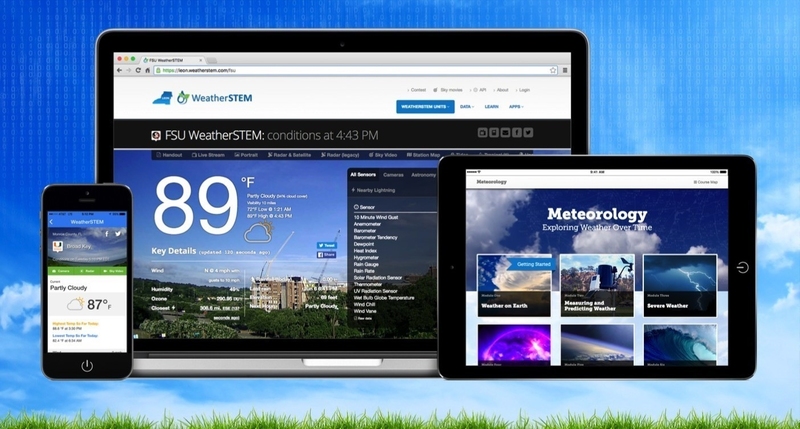 It will also allow teachers to incorporate WeatherSTEM content into an online Canvas course. A recently installed weather system will now provide live, hyper-local data that will be used to energize lessons in science, technology, engineering and math (STEM) at Jacksonville Country Day School. 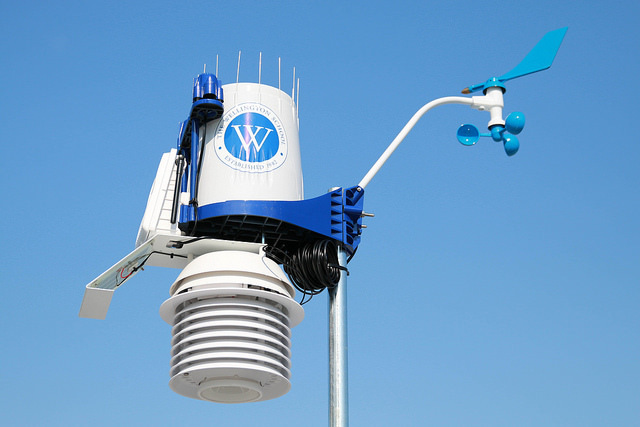 The WeatherSTEM combines data from scientific instruments and sensors with STEM curriculum. The system also provides current in-depth weather information for the area around the Southside school through a dedicated website, which residents may access. As the rumble of thunder rolled over the Deane Bozeman campus Tuesday afternoon, most students and staff were looking up at the clouds. Principal Josh Balkom, however, was looking down at his phone. 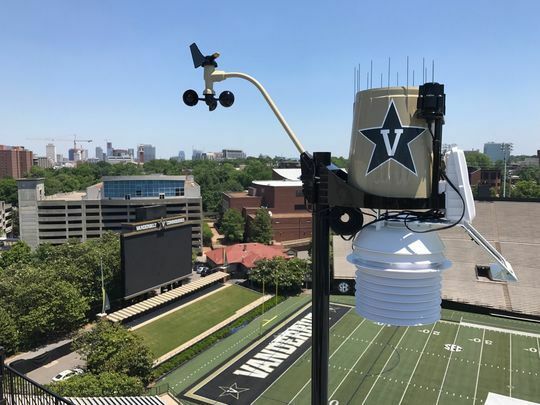 If you're interested in a truly local weather report, check out the real-time data available from a new weather station installed atop Engineering Building 2. 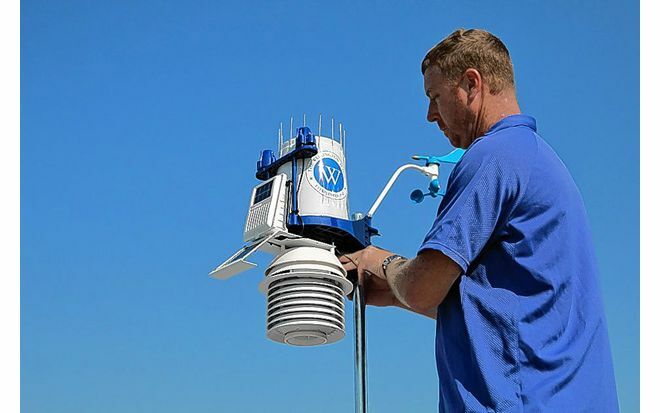 A software pioneer whose passion is weather has created a network of weather stations across the state of Florida for use in schools and elsewhere. WeatherSTEM is a weather station that Mansouri built when he realized the lack of education in Florida surrounding weather. He said the goal was to teach students about weather and allow the teachers to incorporate real live data into the classroom. Students in South Georgia have the tools to learn about weather conditions and their importance. WeatherSTEM donated various equipment and technology to Cox Elementary School to help get them engaged in learning about meteorology. 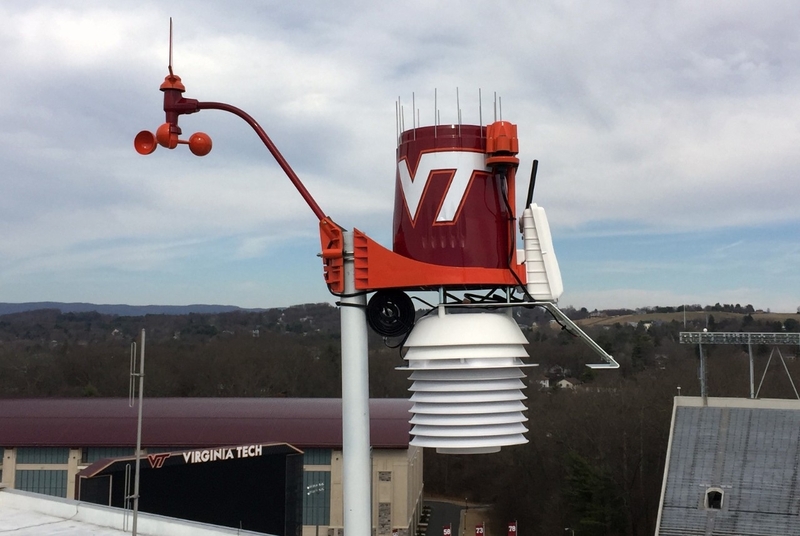 Keeping up with the weather on Virginia Tech's Blacksburg campus is much easier and lots more fun now that the university's first full service weather station has been installed on the roof of Lane Stadium. 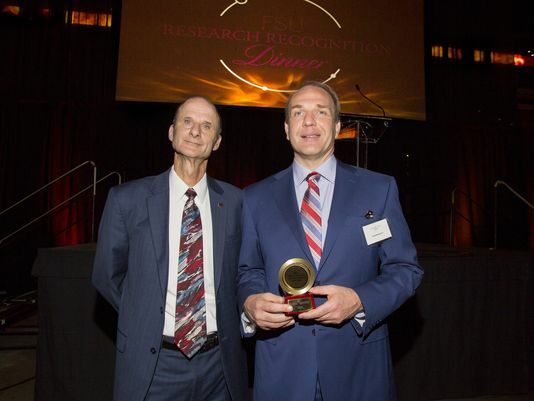 WeatherSTEM CEO Edward Mansouri, a Tallahassee-based entrepreneur and Florida State University alumnus was recognized with the FSU Office of Research Community Partner of the Year award during the universitys annual Research Recognition Dinner event. You can hear the excitement in their voices as students discuss the various aspects of weather. Ten-year-old Lilia Kim is fourth grader at Willow Springs Elementary School in Fairfax. Students are thinking about it now thanks to the recent arrival of a WeatherSTEM station. Sixth grader Naveen Sasikumar had never seen anything like it. "When I first saw it we were all thinking,'What is that?'" he recalled. Soccer brought Eli Dennis to Penn State the first time, and graduate school brought him back. 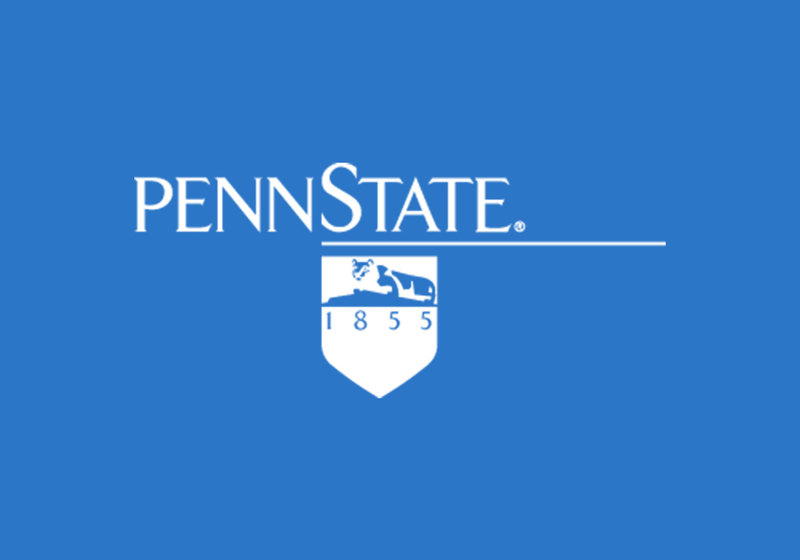 Dennis started his academic career studying biology at American University but transferred to Penn State in 2011 to play on the Division 1 Penn State mens soccer team. Fascinated by meteorology, Dennis chose to pursue a degree in meteorology as a student-athlete. Atlanta weather is known to be unpredictable at best, and Tech has a very innovative way to make sense of it all.Techs Emergency Preparedness worked with WeatherSTEM, a Florida-based company that creates full-service weather monitoring stations that collect weather data and contribute to STEM-based K-12 education.The stations are currently in three strategic locations on campus: Bobby Dodd Stadium on east campus, the Campus Recreation Center (CRC) on west campus and Georgia Tech Police Department(GTPD) headquarters near Center Street. 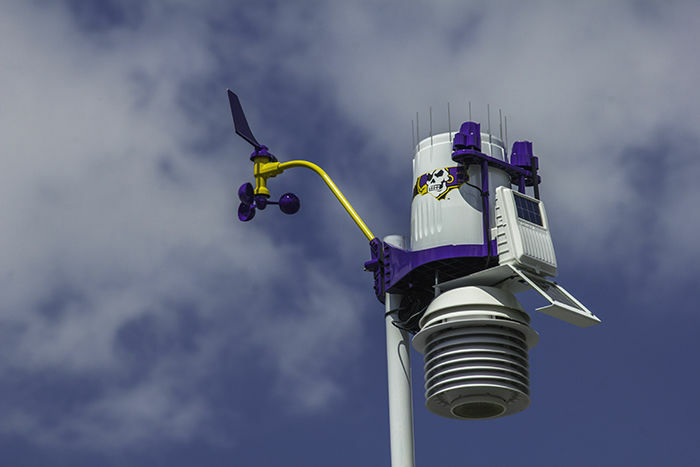 The WeatherSTEM Unit at APUS is part of a network of state-of-the-art insturments and sensors that measure and record environmental data every minute. The information provided by the station goes beyond daily forecasts and current weather conditions. Even though most days it's a given that it'll be really, really hot outside, there are some days when we all want a definite weather forecast. 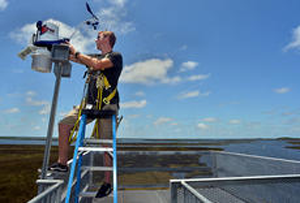 Now, a weather station on the FGCU campus is not only available to provide a daily weather forecast, but other useful weather data as well. 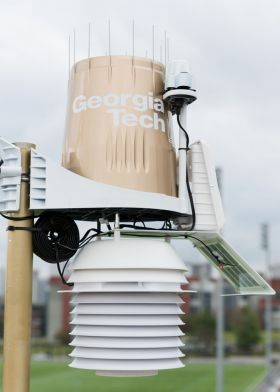 If you've ever checked your weather app rather than look outside your window to see if it's raining, chances are you're going to love the new weather stations installed around the Georgia Tech campus. 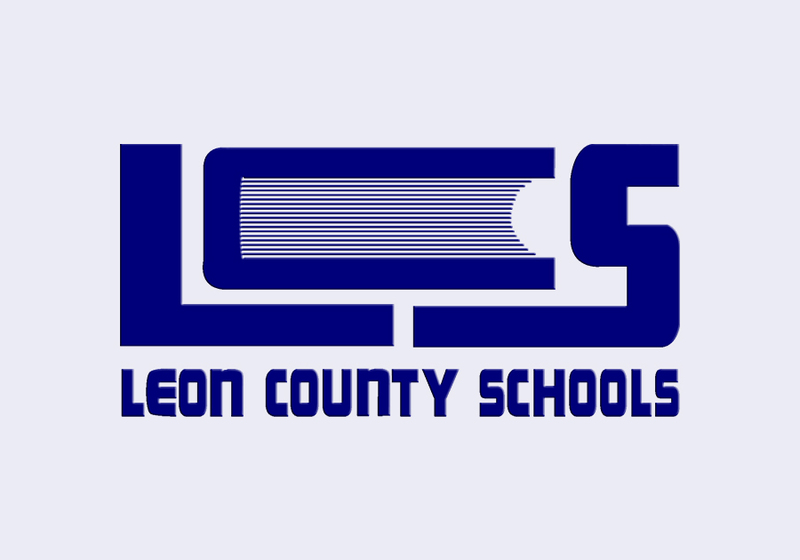 A Levy County school has gotten some new technology to benefit not only students, but the community as well. 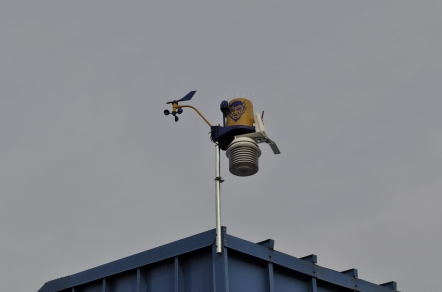 A new WeatherSTEM unit was installed at Bronson Middle High School, the data from which will be incorporated into student lessons and can be viewed online. 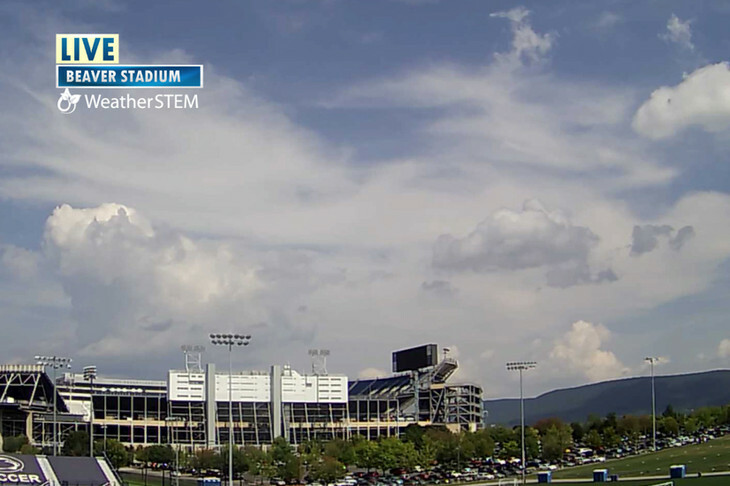 Penn State football fans looking for game day weather conditions and forecasts now have free access to real-time weather data directly from Beaver Stadium through WeatherSTEM ??? a full-service weather station that measures everything from wind speed to soil moisture to solar radiation. 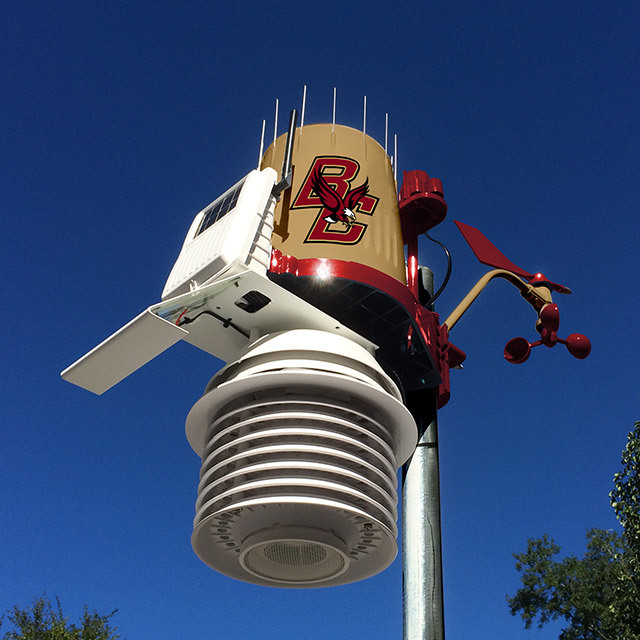 Over the summer, Boston College worked to implement an interactive weather system, known as WeatherSTEM, to more accurately predict weather patterns on the Universitys campus. The system that sits atop Conte Forum broadcasts the data it collects to the public via WeatherSTEM's website. 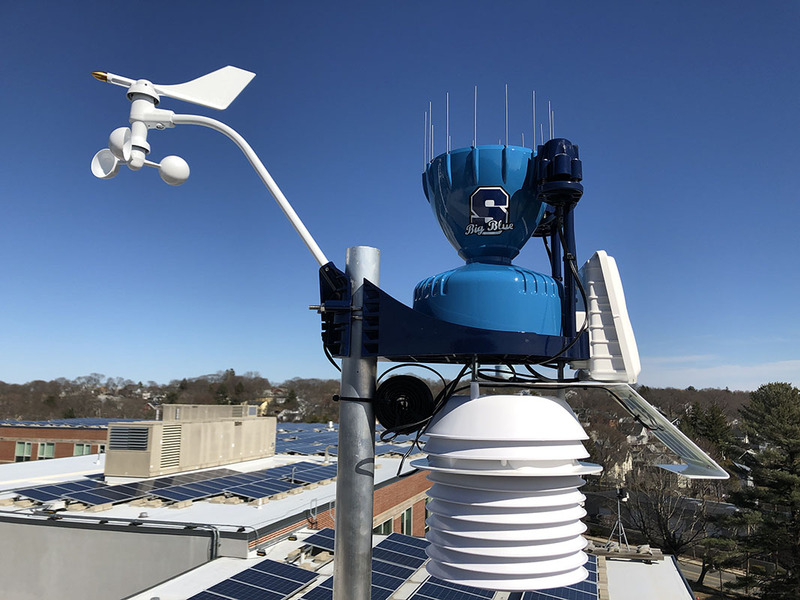 Central Ohio residents looking for real-time weather conditions can get texts with daily updates or have easy access to weather forecasts through WeatherSTEM -- a device installed on the roof of the Wellington School this past summer. Port St. Joe Elementary School added something new to their campus that no one else has in the district and taking learning opportunities to the next level. 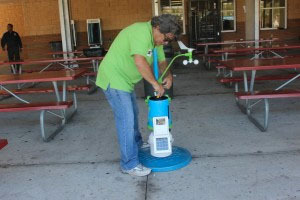 The school added a weather station donated by the company WeatherSTEM. "So to me that's one of the biggest things with this is the opportunity to make science real as well it can be math real. And really just give our children the opportunity they may not have otherwise," Principal, Sandra Cook said. Port St. Joe Elementary School became unique in the county for another reason last week. 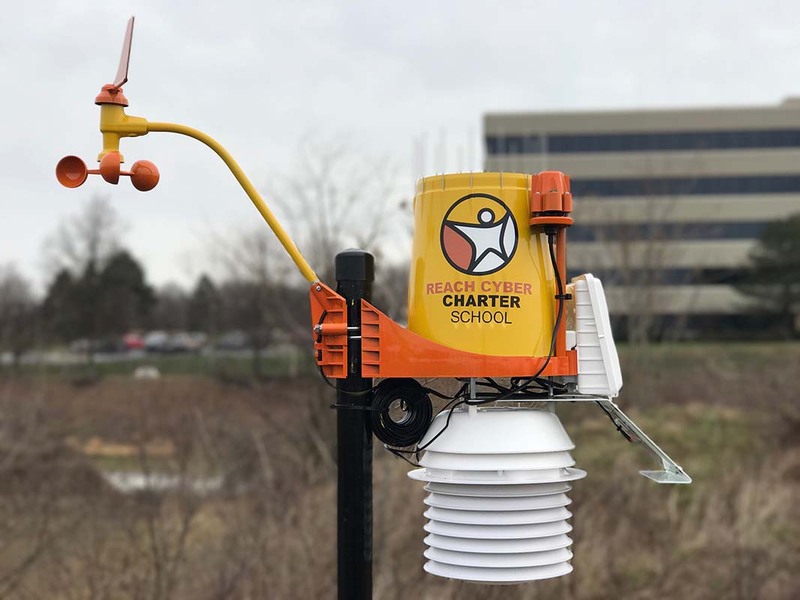 The school became the districts first and only to be provided a weather station from WeatherSTEM, which aims to use the weather for a host of lessons across science, technology, engineering and math, the so-called STEM subjects. We are very fortunate to have this system installed in our school, said Principal Dr. Sandra Cook. 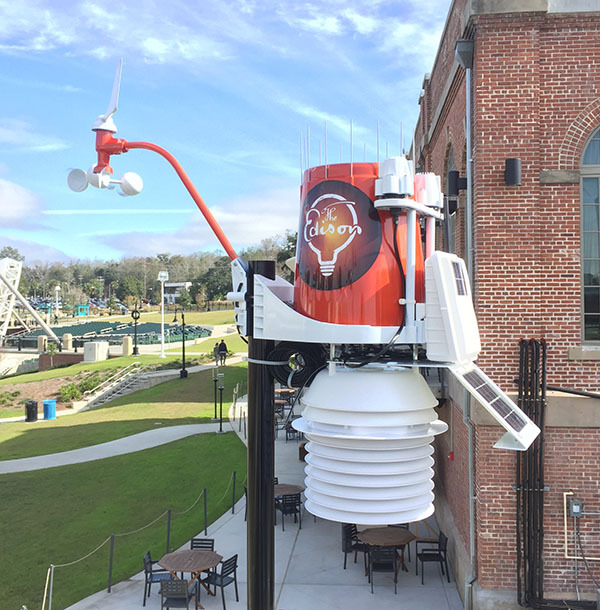 FSU Panama City has partnered with FSU alumnus Edward Mansouri, Master of Science in Meteorology, Class of 2000, to further K-12 curriculum in STEM (Science, Technology, Engineering and Mathematics) with the introduction of the FSU Panama City WeatherSTEM station. Perhaps youre working away in your Maloney Hall office, or doing research in ONeill Library; maybe youre waiting for the shuttle bus on Newton Campus, or walking toward Brighton Campuswhen you notice dark clouds moving in and you hear a distant rumble of thunder. At times like this, you think, it would be useful to have a Boston College weather update. WeatherSTEM systems are currently being set up all around Florida. Last month, Florida Panhandle Technical College was the lucky recipient in Washington County. Tuesday, the company's CEO spoke to the Kiwanis Club about how it not only benefits student education, but the community as well. Students at Melrose Park Elementary are getting a first-hand look at the weather by using this in-school weather stem program. Melrose Park is the only school in Columbia County with this technology. Before a drop of the downpour that soaked the area Thursday morning even fell, Eli Dennis stood outside on the final day of Ag Progress Days wearing a waterproof coat and hat and confidently made a forecast about when the deluge would begin. Wellington recently teamed up with WeatherSTEM to provide a dynamic display of meteorology for the entire school community. 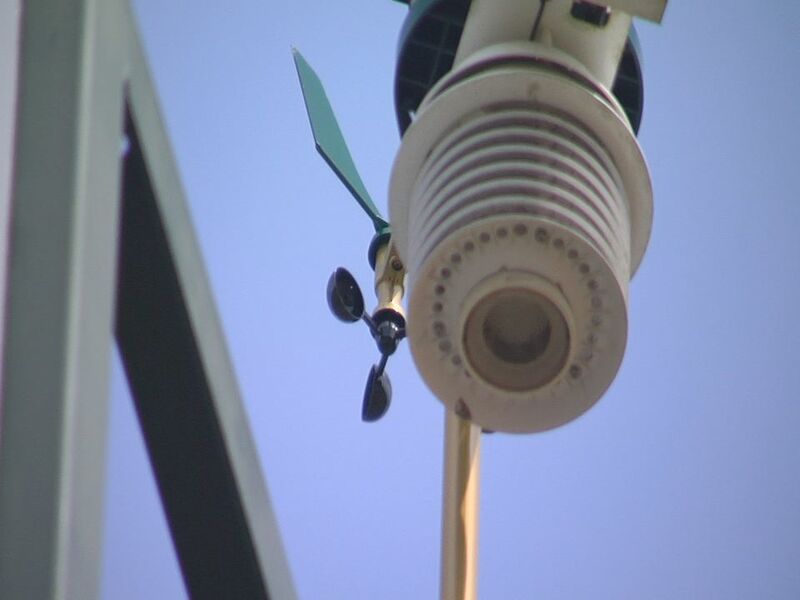 Installed on the roof of the school, the WeatherSTEM unit sensors will gather and store data on the current weather and weather forecasts so that students of all ages may engage in STEM-based lessons and activities. 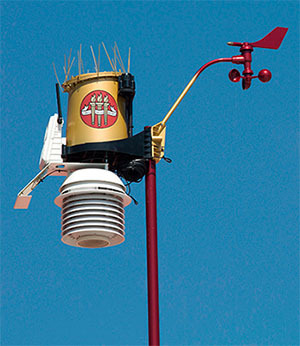 The Pasto Agricultural Museum WeatherSTEM Unit at Ag Progress Days was recently installed at the show site. 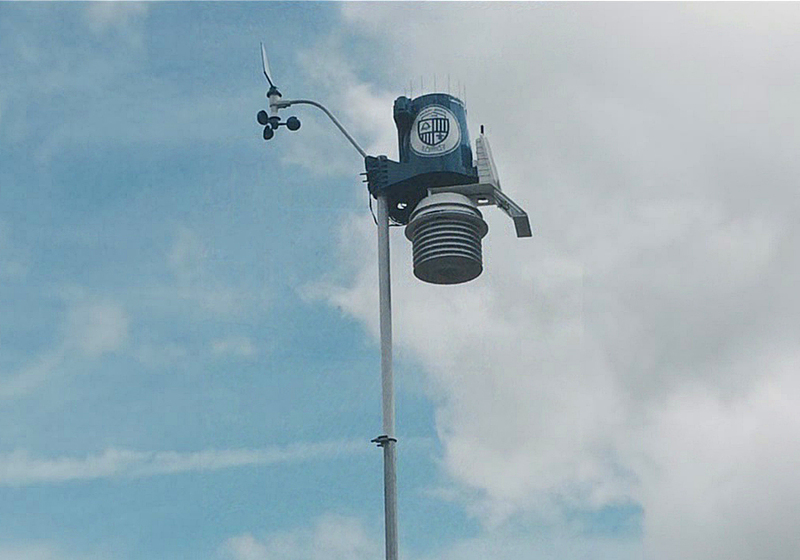 The unit integrates weather sensors that generate and store data. Officials with WeatherSTEM installed a weather station on the Florida Panhandle Technical College campus Friday. The station allows anyone to log on to the Washington County WeatherSTEM website and find exactly how much it rained, solar radiation, distance of the closest lightning strike, and the forecast. 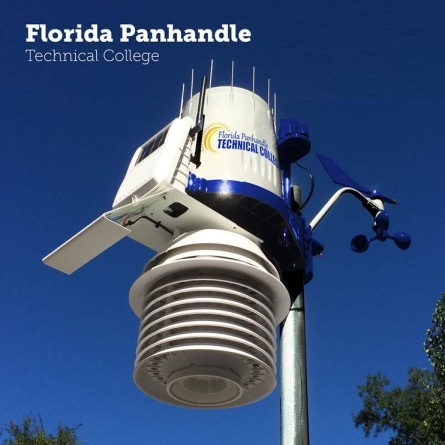 Florida Panhandle Technical College (FPTC) will be home to a new WeatherSTEM weather monitoring station as of July 24. The public is invited to attend a ceremony commemorating the installation of the weather station. 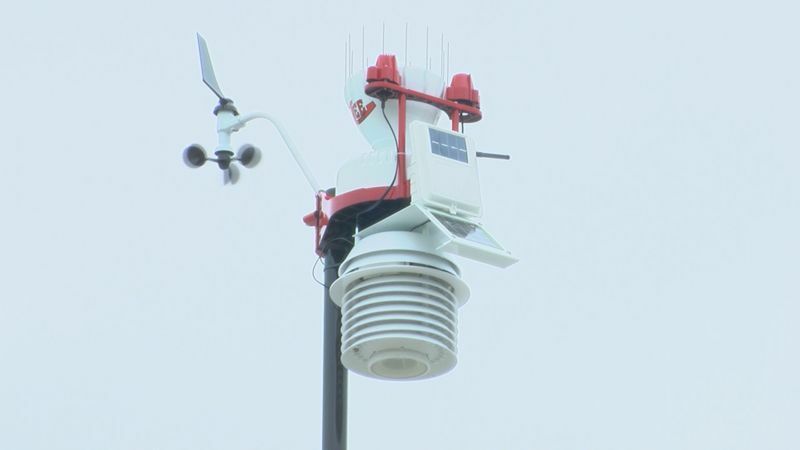 Tolland High became the first high school in New England Wednesday to have a WeatherSTEM Station installed on its campus. "We are hoping to use this as we develop our science curriculum," said Carolyn Tyl, Tolland Public Schools director of curriculum and instruction. The world is moving faster and faster, and big data is becoming one of the most useful tools in the world. Now State College is at the big data forefront, and you'll be able to collect every aspect of outside conditions within seconds. If you want to know what the weather is doing on the medical campus, you no longer have to look out the window. 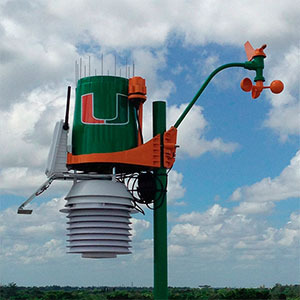 The University of Miami, in partnership with Ucompass, a software and services company that helps educational institutions create weather-based lessons, activities and assessments, has installed WeatherSTEM a platform that delivers real time hyperlocal weather information to computer, tablet or smart phone, and across social media on all three campuses. In April, a powerful line of thunderstorms was barreling toward Florida State University's main campus in Tallahassee, bringing with it severe lightning and dangerous rain and wind conditions. 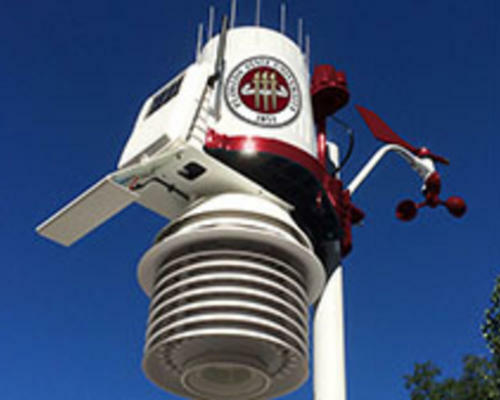 At the same time, Florida State's WeatherSTEM unit sent detailed weather information to FSU's emergency alert system, including the exact location of lightning strikes and precise wind speeds. Tallahassee businessman Edward Mansouri wants K-12 students to understand the importance of weather beyond its influence on our everyday lives. He wants them to get more engaged in how weather impacts everything from agriculture to backyard gardening and climate reports. W.R. Tolar School is very proud to have been nominated and awarded the WeatherSTEM project grant. The W.R. Tolar K-8 WeatherSTEM Unit is an integration of weather sensors installed, free of charge, in several locations around the school. Florida State University Panama City now has its own weather tracking station. Ed Mansouri, the operator of the weather tracking project WeatherSTEM, visited the campus Tuesday along with FSU Emergency Management Director Dave Bujack to oversee the installation of the station on the roof of the Holley Academic Center. 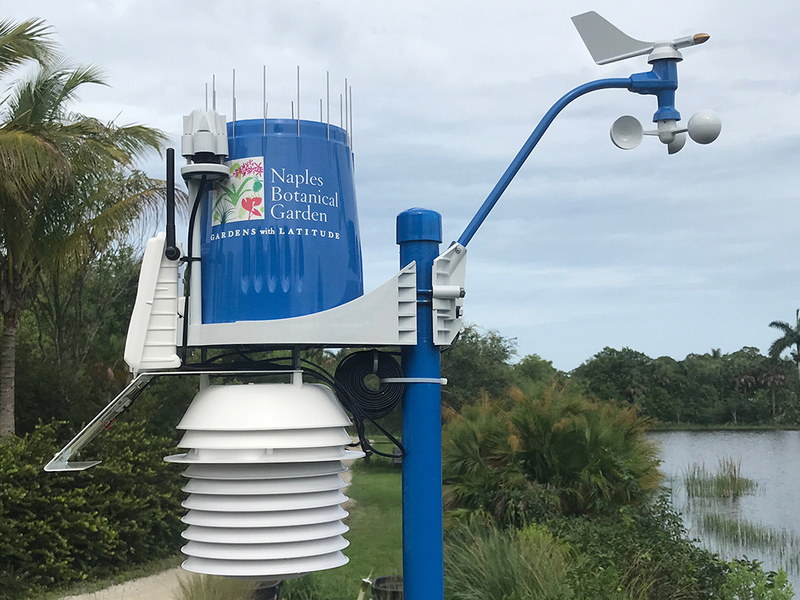 Local teachers and students now can easily access local weather data specific to their schools area, thanks to three newly-installed WeatherSTEM systems. The students at Dodgertown Elementary school have a bird's eye view of what is happening in the sky, even when they are studying inside the classroom. 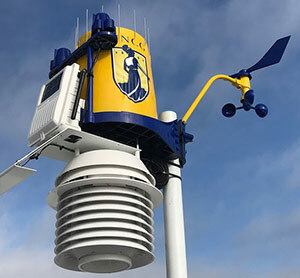 They are the only school in the county to have been awarded a WeatherSTEM Unit, which uses sensors to gather and store data that is then displayed on a website featuring current weather conditions as well as forecasts, weather notifications and alerts. Also on the site are lessons and activities that make this a valuable teaching tool, as well. Students born into the generation of mobile phones, computers and Internet connections came by a new way to view the weather Thursday. 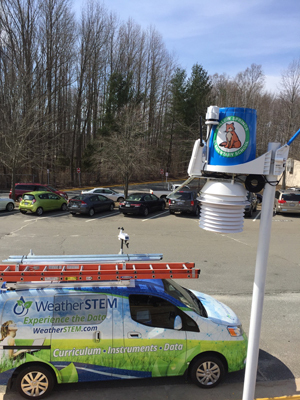 A crew from the WeatherSTEM company installed an innovative science platform to monitor weather and agricultural data at Robert Jenkins Middle School. 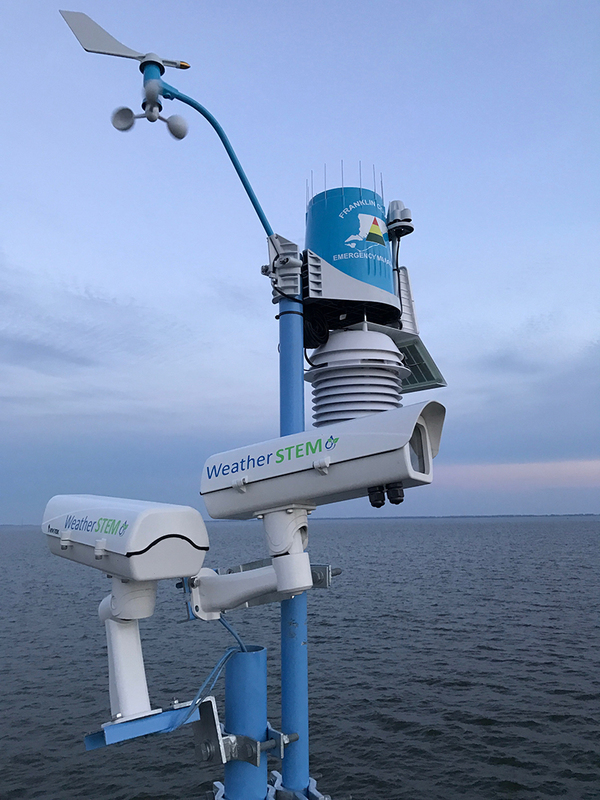 The school system's Marine Science Station is the latest recipient of a high-tech interactive weather unit designed to marry meteorology and education. WeatherSTEM donated and installed the weather monitoring unit last week. The station has two units - one that is perched atop the viewing tower overlooking the marshes and another in the Salt River to measure water temperatures, tides and soil temperature. 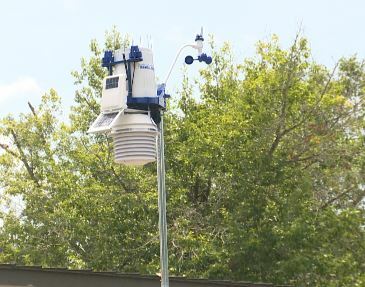 A new weather station with data that the public can access through downloadable apps will be revealed Friday at Malone School after the unit is installed that morning. 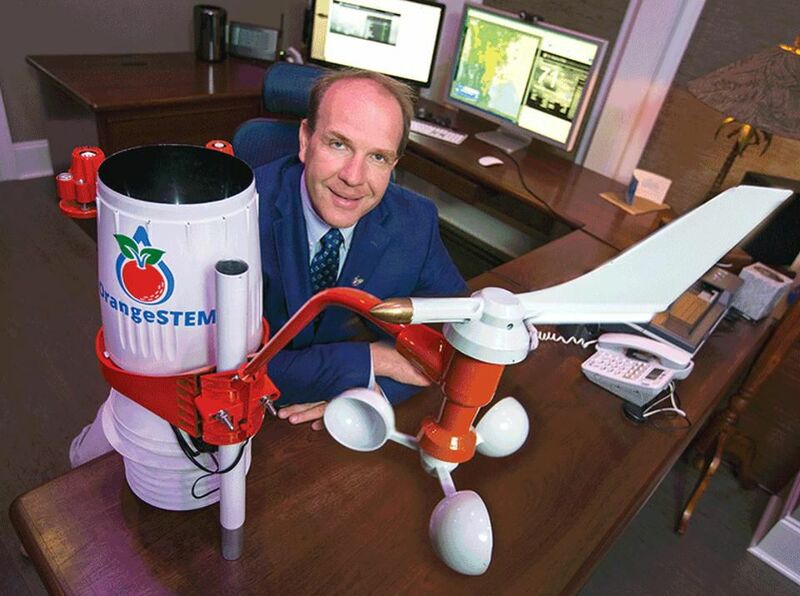 The WeatherSTEM equipment, worth about $2,500, was donated by its creator, Edward Mansouri. 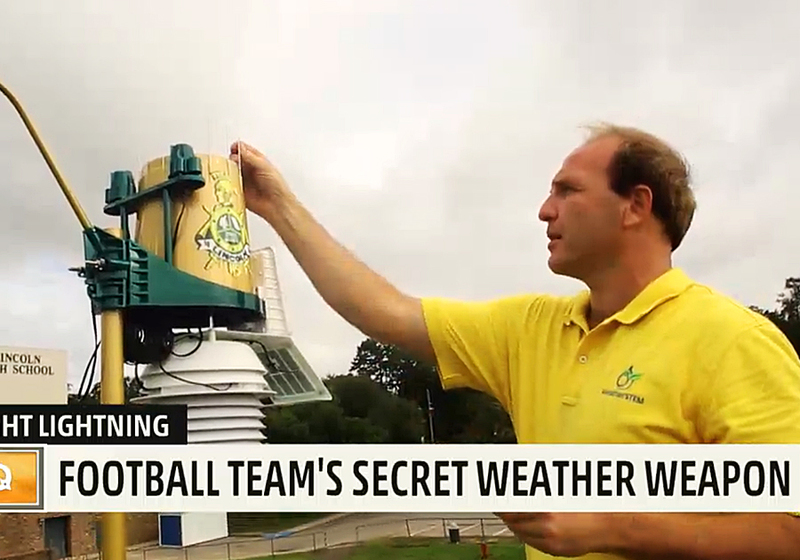 Watch out meteorologists Steve Weagle and Glenn Glazer, there's a new weather station in town. 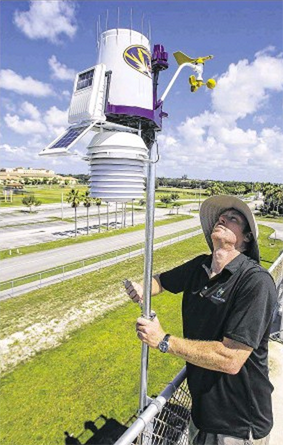 Boynton Beach High School has received a $6,000 WeatherSTEM unit from the Tallahassee-based company of the same name. It was installed Thursday, and while it will be used by students and teachers, its data is available to the community. 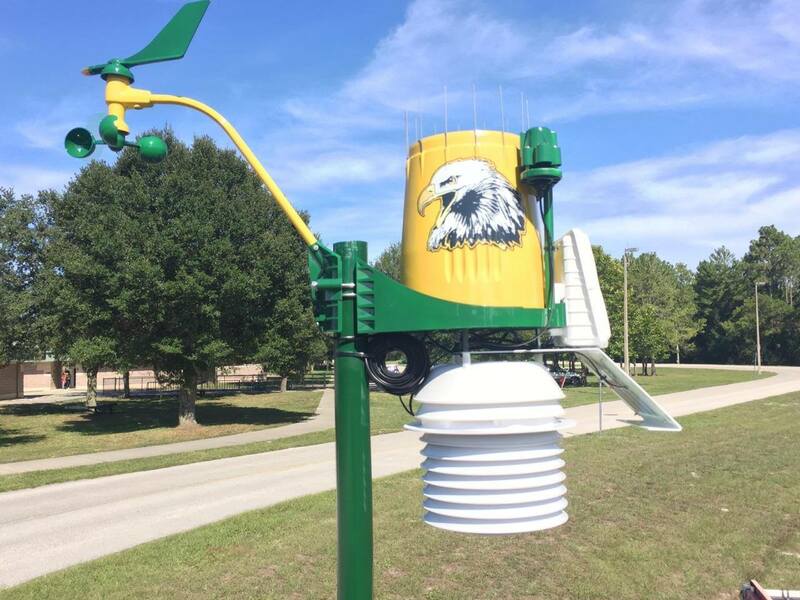 Mount Dora Middle School received a high-tech weather station from WeatherSTEM on April 15. The unit will help students by incorporating science, technology, engineering and mathematics (STEM) with weather. 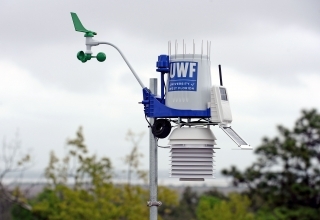 The unit includes a weather station, an agricultural monitoring system and a cloud camera. 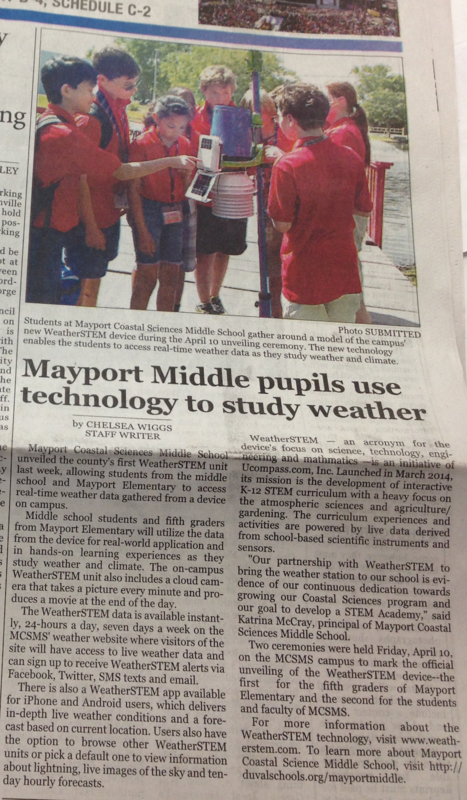 Data from the device will be uploaded to WeatherSTEM constantly throughout the day and integrated into a platform that serves a K-12 STEM-based curriculum. When Ed Mansouri was just 6 years old, he developed a fascination with weather. Still an unabashed meteorology enthusiast, Mr. Mansouri, CEO and Founder of UCOMPASS, a Tallahassee-based company that pioneers education technology, went on to develop the WeatherSTEM, which integrates weather stations, collected and distributed atmospheric data, and STEM-based education. Mr. Mansouri?? ?s hope is to make ordinary weather information intriguing and introduce students to science using real data. 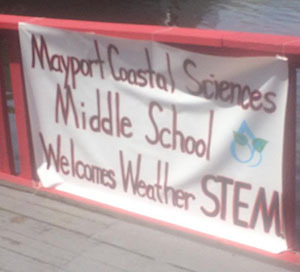 Mayport Coastal Sciences Middle School unveiled the county's first WeatherSTEM unit last week, allowing students from the middle school and Mayport Elementary will utilize the data from the device for real-world application and in hands-on learning experiences as they study weather and climate. The on-campus WeatherSTEM unit also includes a cloud camera that takes a picture every minute and produces a movie at the end of the day. 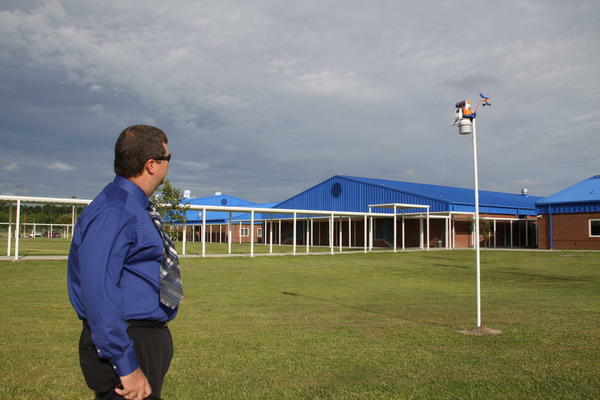 Emerald Coast Middle School recently received a high-tech weather station from WeatherSTEM. The unit will help students by incorporating science, technology, engineering and mathematics (STEM) with weather. Sixth grade science teacher Leigh Glenn applied for a grant from WeatherSTEM back in October, she said. WeatherSTEM donates a device to one lucky school within each county, said Glenn, noting ECMS is the 25th school to receive the weather station. It all started when 6th grade teacher Leigh Glenn wanted to engage her students about weather. "Weather is taught in almost every grade level, but it is very intensive in 6th grade," she said. Glenn found Weather STEM online, and applied. "I really talked about promoting STEM here, and they were like, this is an ideal place, and that's how I got it," said Glenn. The weather in the Panhandle is incredibly diverse. The information gathered from the sky can be informative and fun, especially now for students at Emerald Coast Middle School. The new equipment will help bring the classroom conversation outside. 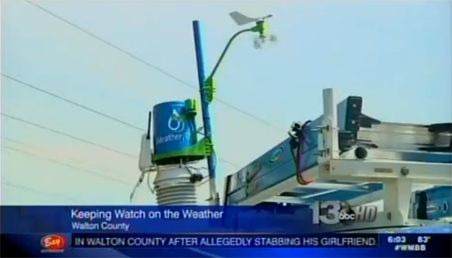 It's called a WeatherSTEM monitoring unit. 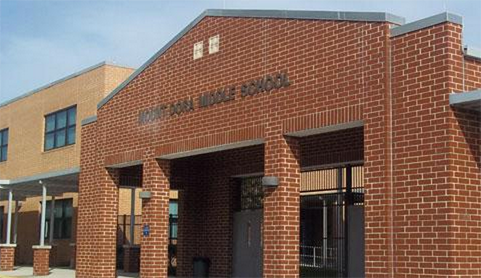 What's right with our schools? 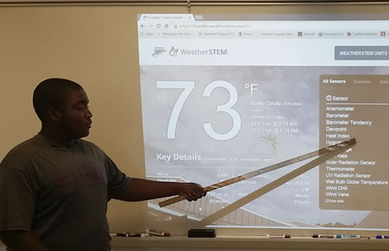 Poinciana High School students compile and analyze big data with WeatherSTEM. The system constantly gathers information and helps in more places than one classroom - check out the Poinciana Station Page. 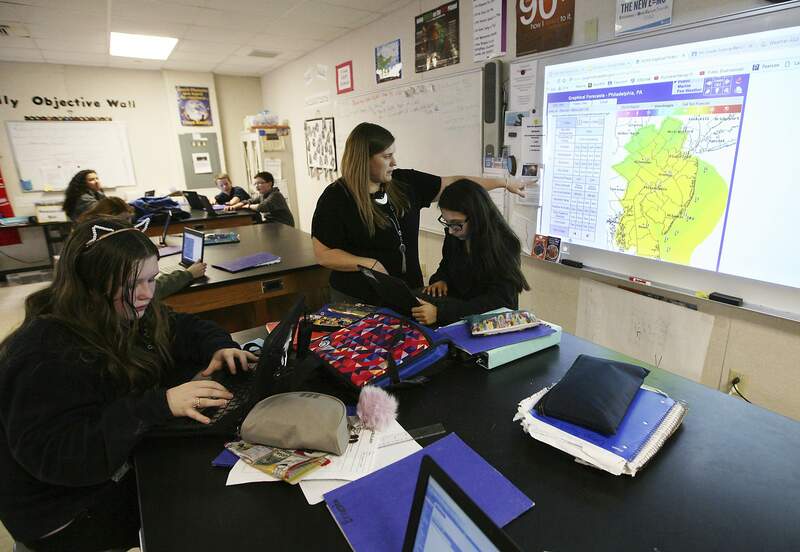 Osceola County schools, through their expanded STEM (Science, Technology, Engineering, Mathematics) curriculums, are teaching their students much more than ever about weather and what can be learned from the data. 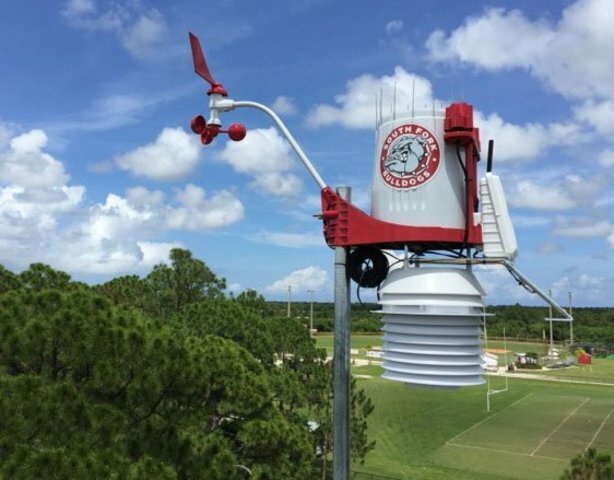 At Poinciana High School, a WeatherSTEM data transmission unit was installed the week before spring break. The school applied to WeatherSTEM, a professionally developed community centered weather network, and won the $5,000 unit. 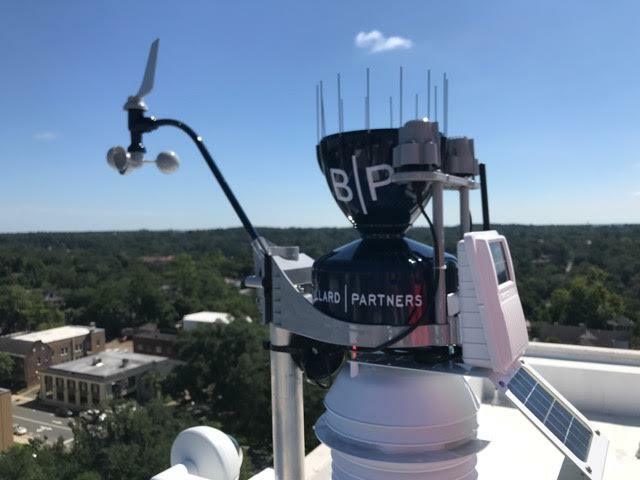 Yesterday, WeatherSTEM, a community centered weather network for schools, installed a weather unit on top of the University of West Florida John C. Pace Library. This unit serves as WeatherSTEM?? ?s donation side for Escambia County and is available for use to all district schools to receive live data and classroom lessons. New weather monitoring gear will help Carver Magnet School students study weather, climate and how to work with data. 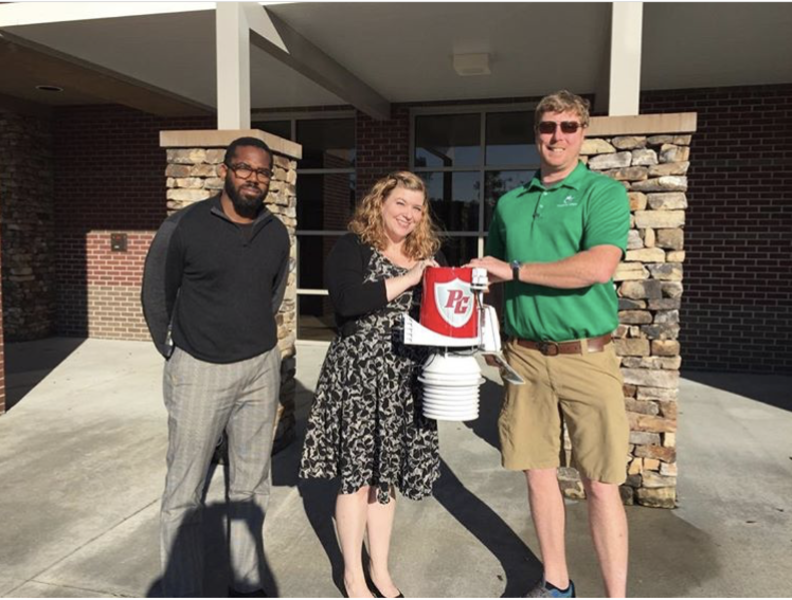 The school recently obtained the first WeatherSTEM unit in Alabama. The unit monitors temperature, humidity, soil moisture, wind, solar radiation and other meteorological and agricultural data. The unit cost about $3,000 and was purchased by funds raised by the school?? ?s parent-teacher organization. 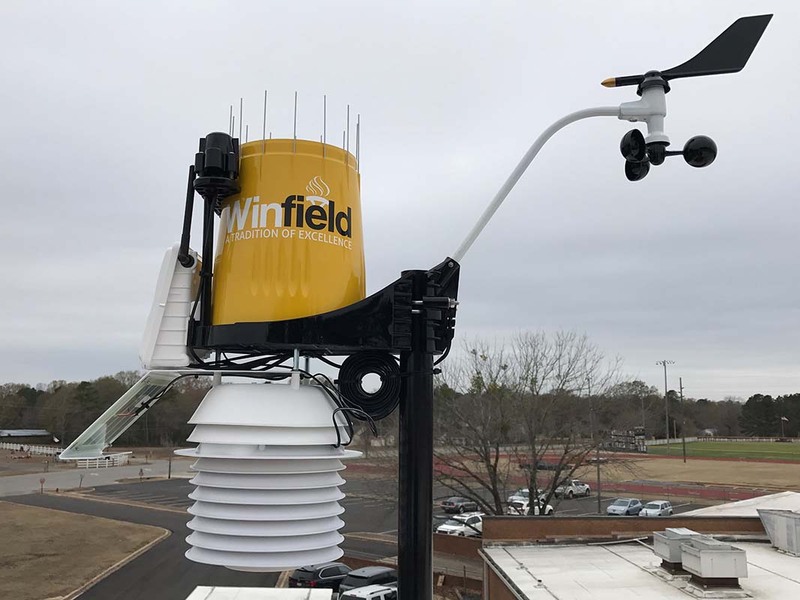 Carver Magnet School will have the first WeatherSTEM Unit in the State of Alabama installed on campus Thursday, April 2nd, with a press conference at 2:00 P.M. 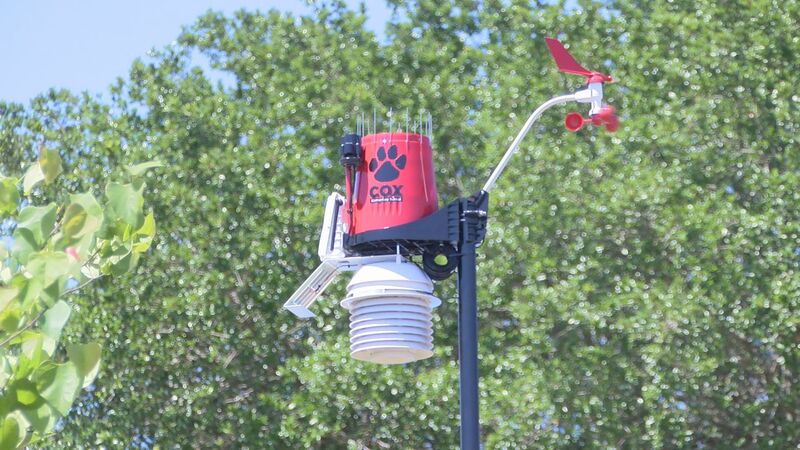 This device will provide real-time weather data to the community and the school. 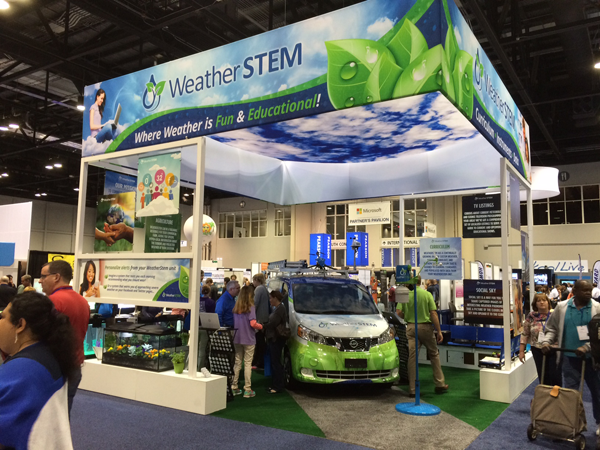 For the 2015-2016 school year, students in the school's Science courses will utilize this data for real-world applications in the STEM areas of science, technology, engineering, and mathematics as they study weather and climate. Are you curious about how weather predictions are made? 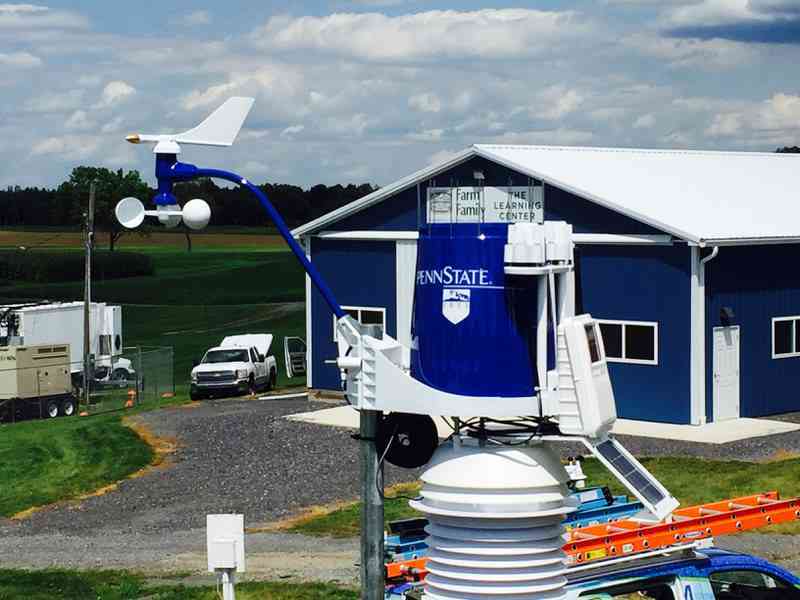 Come to Penn State, home of our first Pennsylvanian WeatherSTEM Unit, and find out! 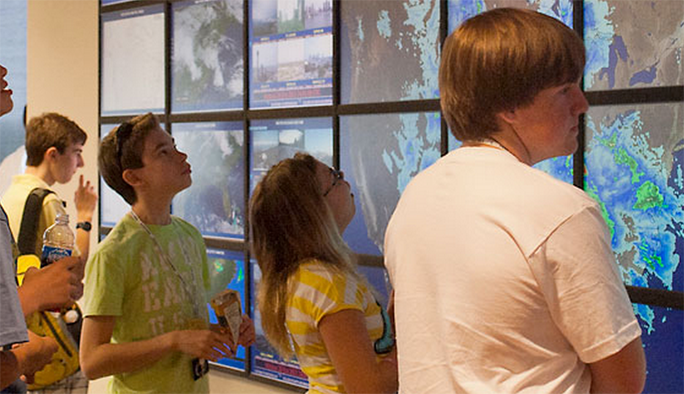 During this week of camp, designed for students who will enter grades 8 through 10 in the fall of 2015, you will receive hands-on experience in many aspects of weather, including the actual process of making a forecast. This camp will be held at the premier location for studying weather, Penn State's Department of Meteorology at the University Park campus. Taylor Technical Institute (TTI) received a free weather station Wednesday which will be used in student curriculum as well as provide real-time weather data to the general public. 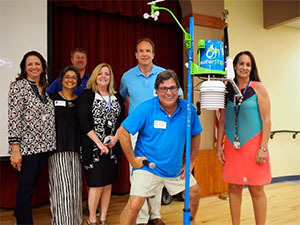 The station was donated by WeatherSTEM, a Tallahassee-based initiative run by Edward Mansouri, whose lifelong love of weather and a career in computer programming have combined into a movement to donate one of WeatherSTEM?? ?s custom stations to a public school in every county in Florida. Dundee Elementary Academy students are making bridges out of marshmallows and testing them to see what design would support heavy truck traffic through Tampa. They are using straws to design tall and sturdy observation towers, with SeaWorld in mind. They are building - and launching - rockets; in their classrooms they are using iPads and iPods. 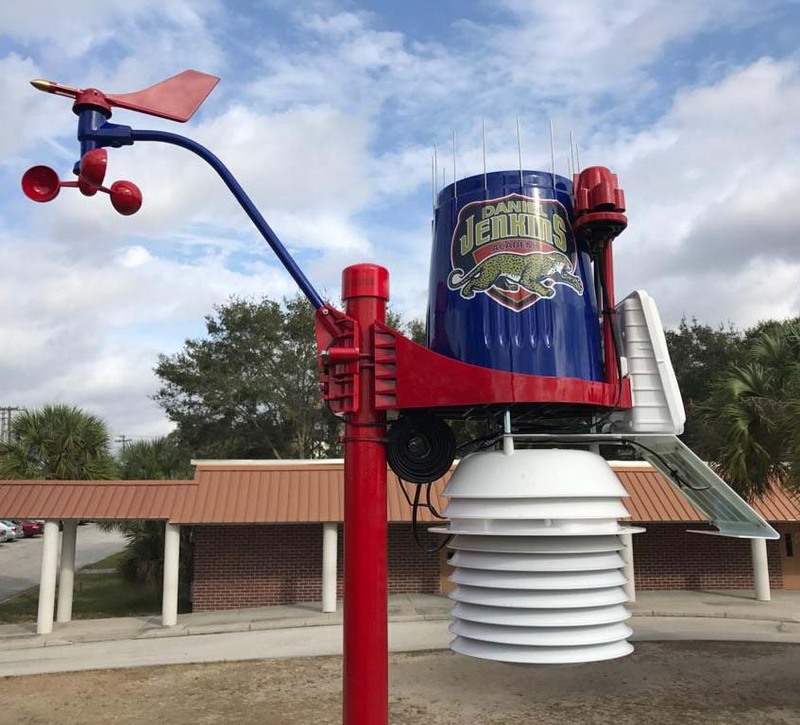 Now Dundee Elementary Academy, a public magnet school where the focus is science, technology, engineering, and math (STEM), is the first in Polk County to have its own weather station. Dundee Elementary Academy has a lot of "walkers." Not zombies, but students who walk to school from their nearby homes.Now they have a way of knowing what the weather is like at school before they even step out their doors, because Dundee Elementary Academy has Polk County's only WeatherSTEM program. 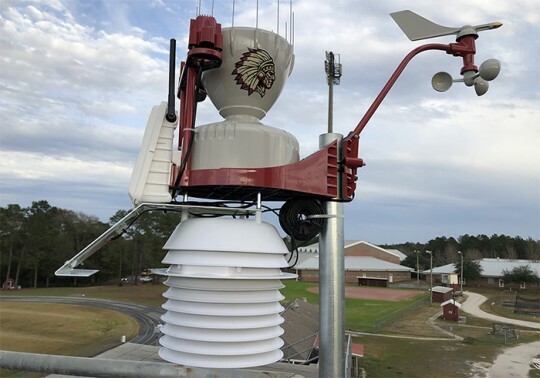 Holmes County High School is home to a WeatherSTEM weather station installed on Feb. 27 at no cost to the school district. The station receives data from an integrated sensor suite made up of transmitters placed in several locations around the campus. The main station pictured uses an anemometer to measure wind speed and transmits data every 1.5 seconds by antenna to a box located in the band room. The system includes a west-facing cloud camera mounted on the roof that takes a picture once a minute. 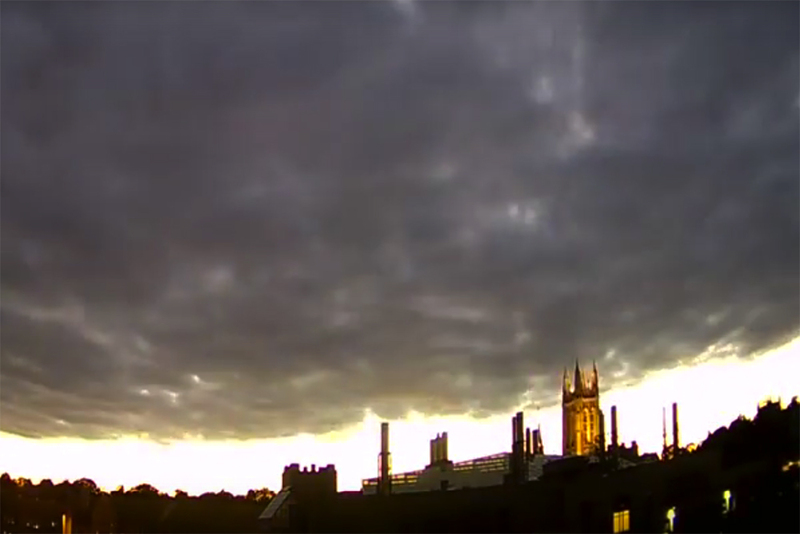 Cloud images can be viewed in a time lapsed video. Lafayette County is the 16th of Florida?? 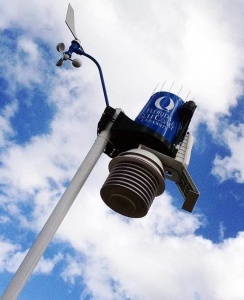 ?s 67 counties to receive a WeatherSTEM weather station. 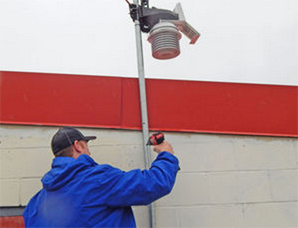 The station was installed on the press box at the Lafayette High School football field on Tuesday, Feb. 17. It measures wind speed, soil moisture, solar radiation and much more. The station was donated to the school from the WeatherSTEM company. 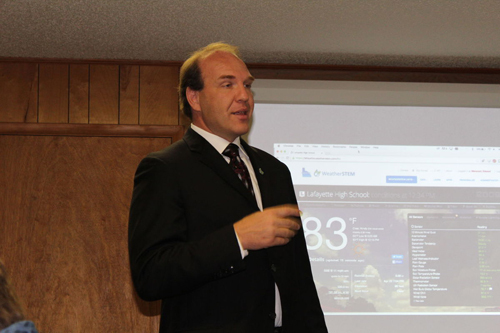 Ed Mansouri, CEO of WeatherSTEM, brought his team to Lafayette County to install the station and teach students and community members about how the station is going to be beneficial for them. During Hurricane season, June to November, South Florida has always been prone to extreme weather. 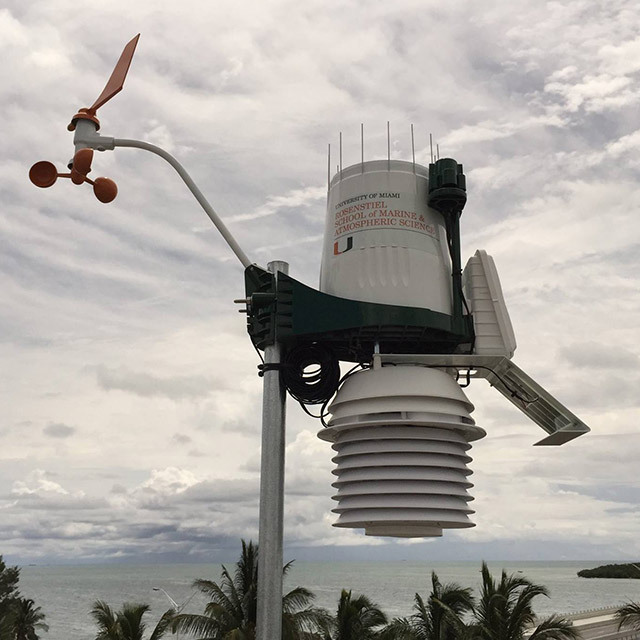 Over the years, the University of Miamis Office of Emergency Management (OEM) has worked to implement services like lightning sirens to keep the UM community aware and prepared. The recent addition of WeatherSTEM, an accessible weather information system, checks off another box in UMs storm-ready status. WeatherSTEM has announced plans to donate one complete WeatherSTEM system to each county in Florida. 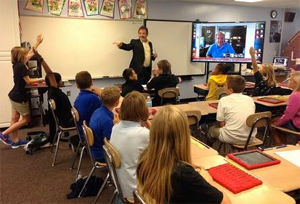 The announcement was made at FETC during the annual technology conference held in Orlando. Mr. Edward Mansouri, founder of WeatherSTEM, shared plans to install at least one WeatherSTEM Package in each of Florida?? ?s 67 counties by the end of 2015. 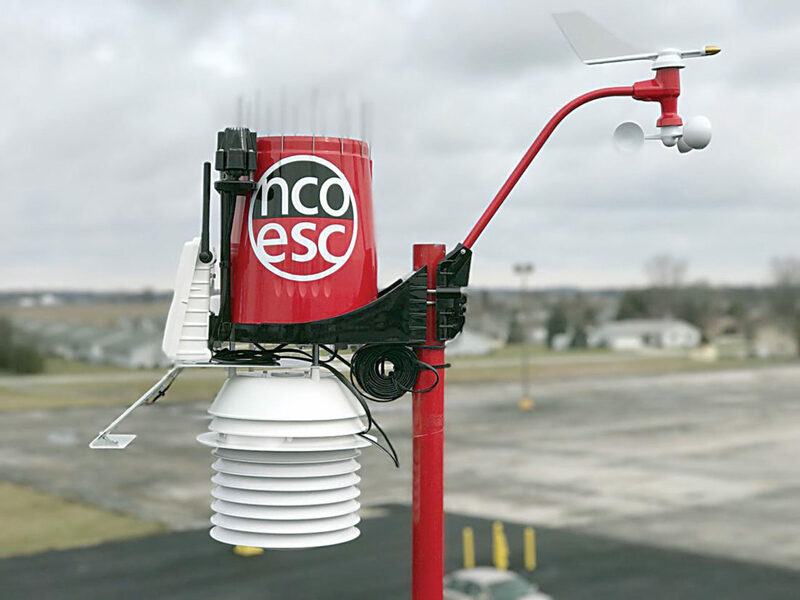 The company is now accepting nominations for the 24 counties that do not currently have a WeatherSTEM unit or an agreement for future installation. The full list of counties can be found at: http://florida.weatherstem.com/giveaway.html, and an announcement of the selected donation locations is expected by the end of February. Fifth-grader Emma Kalcounos wanted to know why weather is getting more extreme so she asked meteorologist, technology firm founder and school curriculum developer Edward Mansouri during a video chat in science class. WeatherSTEM Project Protecting Student Athletes! 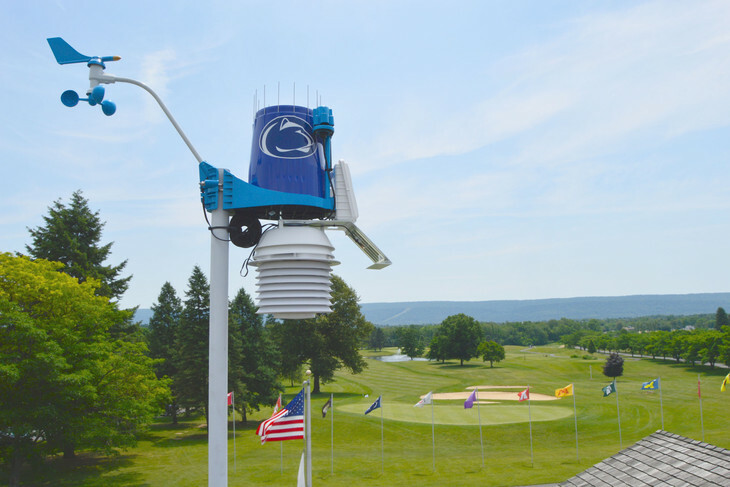 Two weeks ago, Ed Mansouri (PSU '95) installed the WeatherSTEM system atop the administrative building at the Penn State Arboretum. 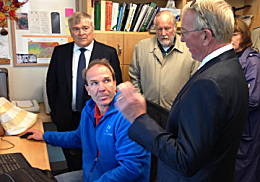 Ed and his team were welcomed by Dr. Eric Barron, Dr. Kim Steiner, and Dean William E. Easterling. Ed'sdonation of a WetherSTEM system will allow local educators, grade school, high school, and university alike to access and analyze real time local data generated by the WeatherSTEM system. In Tallahassee, Florida a high school football team has found a secret forecasting weapon that gives them a competitive edge. 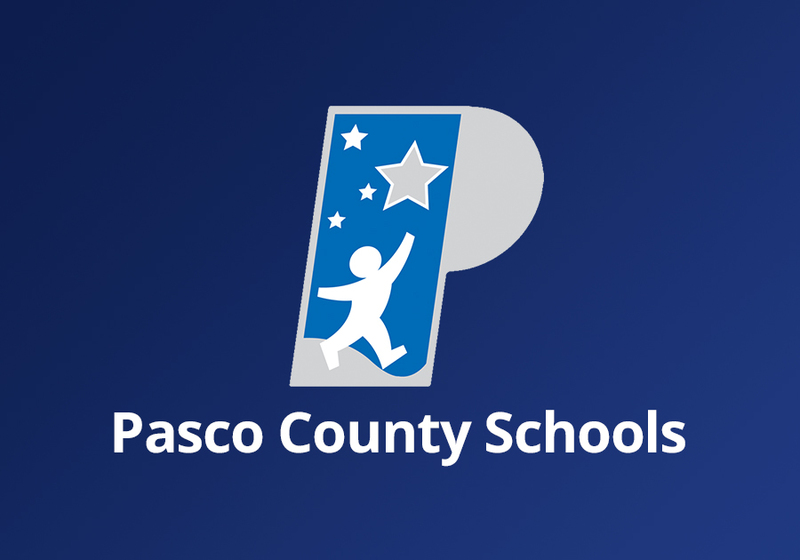 Learn how Pasco Schools is using WeatherSTEM to inquired student engagement in STEM. UNIVERSITY PARK ??? While the Penn State Arboretum will always be a place for plant lovers, it may find a new following among weather wonks. That's because the University's inviting garden with oaks, flowers and ornamental grasses is now also home to a high-tech weather system. 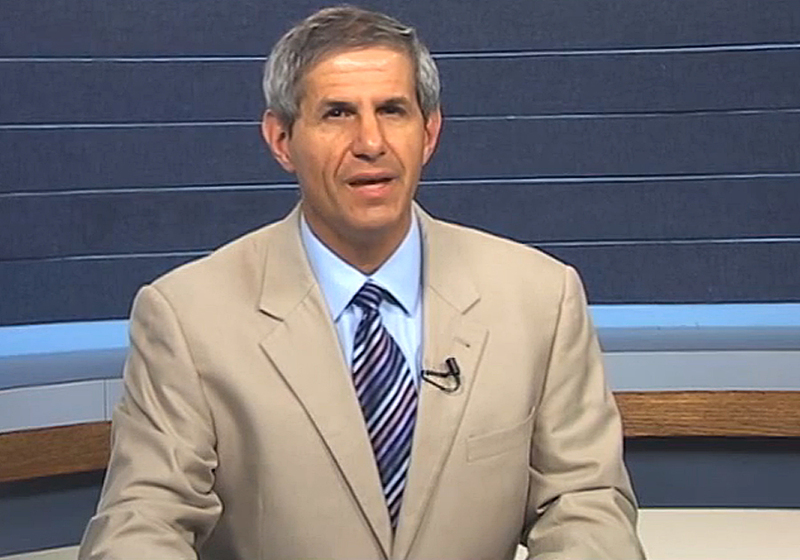 WeatherSTEM CEO Edward Mansouri was interviewed July 8, 2014 by Penn State Weather World Producer Jon Nese. The segment was aired October 21, 2014 coinciding with Ed's visit to Penn State to install a WeatherSTEM unit on the Penn State Campus. Middle School science teacher Cameron Barton is excited about the new WeatherSTEM unit on campus. "We're already running with it. It's super the kids are thrilled. There's a lot of excitement on campus right now." 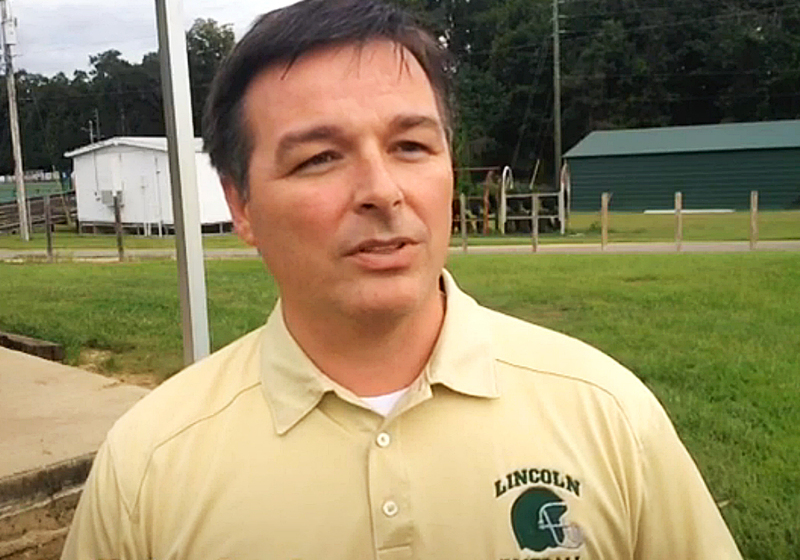 A film crew from The Weather Channel spent Monday and Tuesday in Tallahassee at Lincoln High School for an upcoming story on the way the school incorporates weather data into programs on campus. 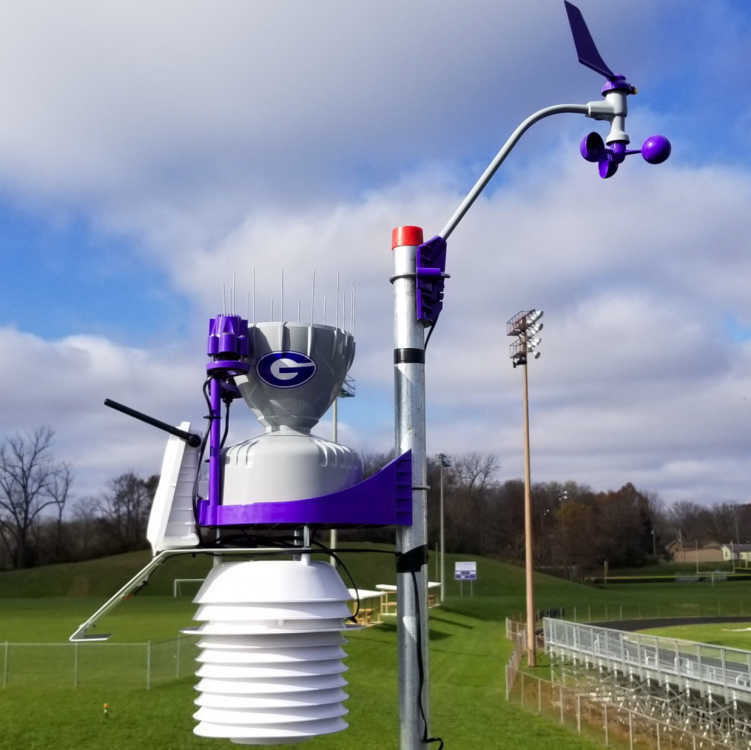 Specifically, the topic is how the school's use of weather data from its on-campus WeatherSTEM station has been a benefit to the athletic program, said principal Allen Burch. 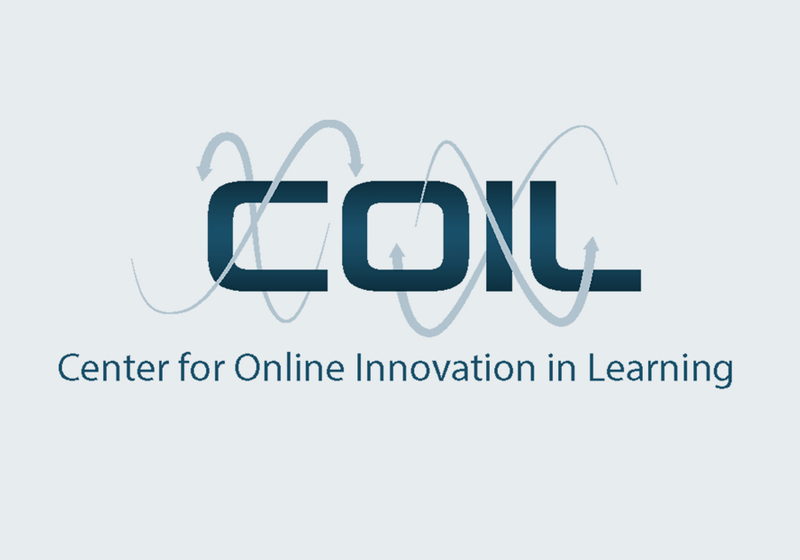 During this COIL Fischer Speaker Series event, Penn State Alumnus Edward Mansouri discussed his experiences building WeatherSTEM through a blending of his background in meteorology with his 15-year career building Learning Management System software.